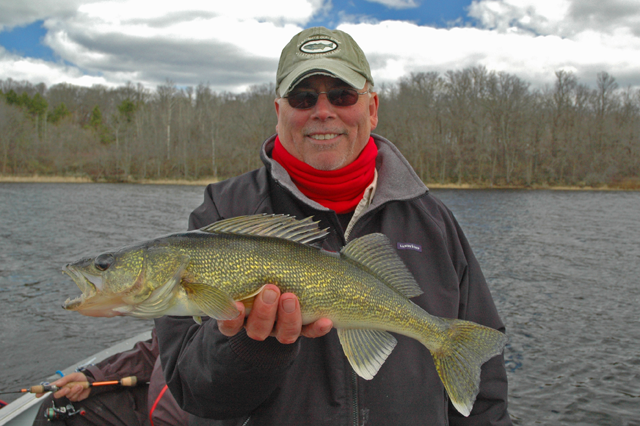 Minnesota Fishing Report May 31, 2014 - For Walleye Fishing, Patience Is A Virtue! And on Friday (may 30), the Danielson family proved it on Upper Red Lake. Shiner minnows are still located on the shallow breaklines and that means that so are the Walleyes. For us, 1/8 ounce Jig and minnow presentations continue to be the best bet. But a very close 2nd best has been soft plastics. Shad type tails in the 3 to 4 inch range are producing very consistent catches too, especially in the afternoons when warmer water temperatures help peak the Walleye activity. On Friday, Surface temperatures were in the 64-66 degree range, ideal for Walleye fishing! After a few days of burning the candle at both ends, I'm keeping the report short and sweet this morning, but I'll be expanding on everything about Red Lake along with lots of news from Leech Lake and Winnie over the next day or two. (5/31) From the Grand Rapids Area, Nik Dimich says; "Perch and northern pike have also been been on a strong bite. For trophy walleyes and northern pike, Pokegama Lake is probably the best, but the action has also been consistently good to excellent on larger lakes like Bowstring, Sand, Jessie, as well as Big Winnie and Big Cut Foot Sioux. Both a jig and minnow and rig and minnow have been the best presentations. 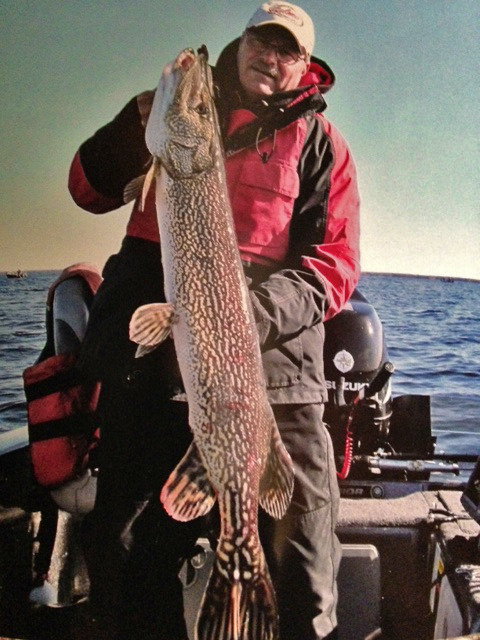 For fast northern pike fishing... read full story >> Grand Rapids Area Fishing Report. " (5/30) From Cutfoot Sioux and Lake Winnibigoshish, Brian Castellano; "Mary and I hit the water this afternoon and took advantage of the great crappie bite that is going on. We sorted through 35 crappies and kept 20 in the 9-11" range. They were up tight to the edge of and in the cattails. The bite turned on the later it got. Bobbers and demon ice fishing jigs w/ minnows were the top producers. I did catch a few fish on the bobber/gypsy jig combo w/ no minnow, but it didn't work as good. A week of warm weather, lots of sunshine and calm water has delivered us a new season. Surface temperatures are approaching 70 degrees and fish activity is entering into the summer peak mode. Walleye fishing on the big lake has been interesting this week. Daytime fishing is "weather dependent" and has had it's ups and downs. But low light or breezy periods have been producing good action and lots of keeper size fish. Minnesota Fishing Report May 30, 2014 - Shallow Water and Twilight Hours Are Your Best Chance To Locate Hungry Fish! For today, just follow Fritz' advice; "Sleep until noon, fish until dark and win!" Don't let the warm temperatures and sunshine fool you. The weather may be trying to tell you that it's summer, but under the water's surface it is still spring. Walleyes may have begun trickling out into deep water haunts, but the lion's share of feeding fish remain in shallow water and without a wind to stir things up, they bite best during low light periods. I proved it to myself again on Bowstring Lake yesterday (5/29). Attempting a strategy to defend ourselves against the effects of sunny skies and calm seas, I and my good friends Fritz and Penny Becker spent a good portion of the day moving from one deep water spot to another. The problem was that it worked, a little bit. Many of the mid-lake bars and deep shoreline points were holding just enough fish to tease us into thinking that we were on the right track. A Walleye here, a Perch there and as usual, small Pike everywhere. Soon, the fish will be there in numbers, but they are not ready to show up just yet. A trek into some shallow water Crappie territory revealed the reason; Baitfish, mostly Shiners are packed into shallow water spawning areas by the thousands. In fact, in some areas they were flowing like a stream through the Bulrushes. I think that as long as the minnows stay there, Walleye, Perch and most other fish will be lingering nearby. Knowing that still didn't help though because we were still stuck with the weather. Like it or not, clear water and a mirror smooth surface don't do much to encourage a shallow water bite. Thanks to our super cold winter, the problem is compounded even more right now by a general lack of good weed growth. Luckily for me, my loving and tolerant crew allowed me to do what I do best. "Wait 'Em Out!" Yup, that's what we did, we just kept fishing until an evening breeze and lowering Sun looked more encouraging. Somewhere around 7:00 PM I suggested one last try, a Hail Mary pass. Let’s go back to the shallows and try to find the best weeds we can and maybe if we're lucky ... Yes, we were lucky and it was good. Well worth the effort of putting in a long day just to be there, in that spot for the next 1-1/2 hours. The evening bite was on and both Walleye and Perch followed the shallow water weed edges right onto our hooks and some of them even made it into our boat. Water depth was 5 to 7 feet and while the weeds were very sparse, they apparently provided enough cover to give the fish some comfort. Surface temperatures are shooting up, especially in the stained water lakes like Bowstring. In some areas, we spied high readings in the mid 70 degree range and found no water temps below 67 degrees. So, if you're reading this report, it's probably already too late to take Fritz' advice about "Sleeping 'till noon". But it's not too late for the rest of it; Do some chores, wash your boat and get your gas tank filled. Then head out to the lake this afternoon and catch yourself a few twilight Walleyes. (5-29) From Grand Rapids, Reed Ylitalo, Wings and Walleyes Guide Service wrote; "Well the water temp is 68 degrees and the male crappies are building and hanging tight to their beds in shallow water! Over the past couple of days, we've had a great crappie bite in shallow water. 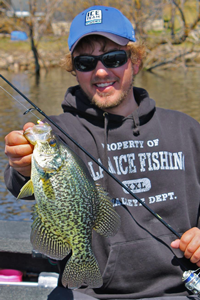 Best depths are 2 to 6 feet, high sun and low winds is a great time to track down big slab Crappies!" - Reed Ylitalo, Wings and Walleyes Guide Service . Traditional summertime tactics catch plenty of big ‘eyes, or else they wouldn’t have become such strong traditions. Lindy Rigging, pulling spinners and suspending live bait account for countless catches. But sometimes, thinking outside the box is an even better way to put more, bigger walleyes in the box. Just ask Jon Thelen. The longtime guide and sage of all things walleye often flips the tactical textbook upside down when conditions—or the fish themselves—dictate an unorthodox approach. As a result, he keeps his clients’ lines stretching while other anglers are struggling. Following are three of his top tricks for turning the tables on ever-elusive summertime ’eyes. Minnesota Fishing Report May 28, 2014 - Leech Lake Walleye Fishing Showed lots of potential on Tuesday. - I've said before that under sunny skies and calm seas, Leech Lake Walleyes can get a super case of lockjaw. I've also said that if you catch some Walleye on Leech Lake under these conditions, then it's an excellent indicator of how fishing would be under ideal conditions. On Tuesday we got stuck with one of those dreaded flat calm, bright skies days. But somehow, we still dragged a nice bag of Walleye fillets home from the stubborn lake. For me, that puts this lake smack dab in the middle of my radar screen for the next time weather predictions are more favorable. Our best fishing spots turned out to be patches of heavy rock in water depths of 8 to 10 feet. I'm guessing that the rocks provided shade and that in turn attracted both minnows and hungry Walleye. Fishing these heavy boulders under these conditions reminds me of jump shooting puddle ducks. You sneak up on the spot, pitch your jigs out and catch as many fish as you can before they get spooked and swim out onto the sand flats. We used 1/8 ounce Lindy Jigs tipped with shiners and as you can guess, there were plenty of snags to deal with. The tactic worked well enough, but I think that I could have done better. I wasn't expecting to stumble into this particular pattern, so assuming that I'll be better prepared next time, I will bring along some nice jumbo leeches and rig up the slip floats for fishing over the tops of these heavy rocks. Surface temperatures on Leech Lake were on the rise! We spotted temperatures well above 60 degrees everywhere and even some areas where the Mercury was above 70 degrees. Until there's a good wind to mix it all up, we won't know the true water temperature, but it is certainly firmly locked into the mid 60 degree range. Lilacs in my front yard are on the verge of opening up today and for me, that means something really special. I think I'll have to take a swing into some of my favorite territory and see if the the old saying is really true YOU KNOW the one; "When the Lilacs are in bloom, the .... " :)!! 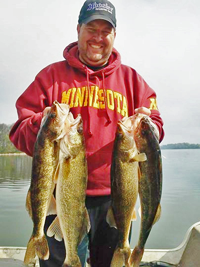 Minnesota Fishing Report May 27, 2014 - Upper Red Lake Walleye Fishing Action Showed signs of fatigue on the heels of heavy Memorial Day fishing crowds (5-26). Don't get me wrong, fishing was still good, anglers were reeling Walleyes in steadily, but at a slower pace than what I witnessed on my visit last week. Surface Water temperatures hovered between 63 and 66 degrees depending on which stretch of the lake's shoreline we visited and the warm temperatures have attracted tons of Shiners onto the shallow sand flats. In fact, I snagged several Shiners when I was snapping my jig as we passed through the large clouds of minnows. On Monday, the epicenter of action awas definitely on the Northeast shoreline. Crowds were heavy, but fishing in the area was manageable. As someone who enjoys the tranquility of moving away from the crowds, I made a couple of moves into quieter territory and while we did catch some fish, this is one time when I have to say that fishing near the crowd was better than experienced by moving away. 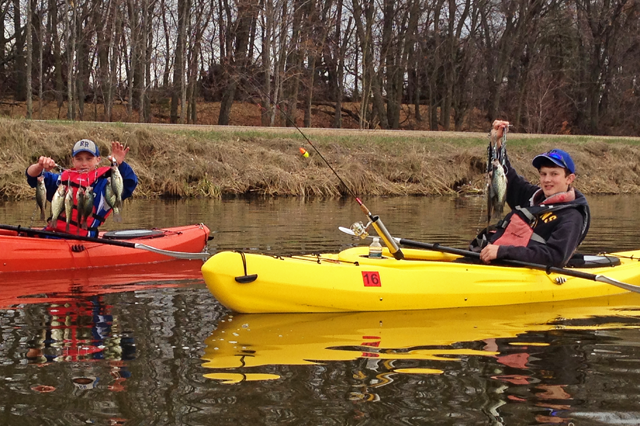 For most anglers, anchoring and fishing with slip floats was the preferred presentation. We saw numerous examples of fishermen preparing to set the hook after saying with a grin "Bobber Down"! Last season I learned a trick about bobber fishing that might interest you. Instead of using a plain hook or a typical summer style jig head below your slip bobber, pull out your ice fishing kit and try using a large #4 or #2 Fostee Jig. The blade is wider and more visible than a typical fishing jig and allows the Walleye to spot your bait faster. The jig also suspends in a vertical position, giving your presentation a little different look which also helps attract more of the "spooky" fish that swim past other presentations. There are two ways to present your minnow; For maximum action, hook your minnow lightly in the tail, just behind the dorsal fin. This positions the minnow's head downward and forces it to swim constantly as it tries to regain a horizontal position. Adding a Wobble Bobber to your setup will give your bait even more action. The float is balanced off center so intead of laying motionless in the water, it rocks side to side giving your bait even more action. For less aggressive presentaions, try hooking your minnow parallel to to the dorsal fin. Gently insert the hook into the upper back of the minnow, just far enough down to hold firmly. Now your Frostee Jig will hang vertically, but the minnow will be oriented hortizontally. This presentation account for lots of bagged fish and works well in winter and summer. Key depths on Red Lake were 5 to 8 feet of water and I noticed that if there are rocks present, the fish can be found in the deeper edges. But if you're fishing on the sandy breakline, most of the fish will be located on the upper edge of the break. To be sure that we are presenting our baits most efficiently, I straddle the break by using the MinnKota to pull the boat into shallow water, 3 to 4 feet. Then I let the boat drift back out into 5, may 6 feet. By staying on the breakline, the bait is being presented to the highest percentage of fish as they move along the travel route. Fishing Report May 26, 2014 - Walleye Action Rebounds - Crappies On Deck. - Beginning our our Sunday morning fishing trip with flat seas and sunny skies didn't exactly strike me as ideal. I thought that maybe I was about to be treated to another day of scrounging for fish, picking them up one by one while those little Green bugs kept flying into my nose. Luckily, my crew Travis, Jacob and Zachary Krug had eaten their Cherios and packed their lucky fishing poles (well, most of them). Just about the time we figured that the flat water would make for better Crappie fishing than it had been for Walleyes, a breeze kicked up and got the surface of Lake Winnibigoshish stirred up. The early reports of slow fishing from friends scattered around the lake were now turning into better news. Fish were starting to move in the current and for several hours, the more whitecaps that rolled in, the better the fish liked it. For most of the afternoon, as long as fishermen stayed in areas where the wind provided good drifting conditions, there were fish to be caught. For us, hugging tight to shoreline breaks was working. We caught fish both by drifting and backtrolling. At times, fish seemed to prefer backtrolling, but as long as I used the drift sock to control our speed, either method produced adequate action. Key depths were 8 to 10 feet and our presentation was simple. Jig and Minnow combinations, 1/8 ounce was the maximum weight. Surface temperatures were hovering between 64 and 65 degrees on the North side of the lake and 59 to 61 degrees on the South end. Crappie fishermen were out and about too and while there weren't any stellar reports, there were at least some fish being caught. With temperatures now holding firmly above 60 degrees, it's just a matter of days before spawning will kick into high gear. With warm weather predicted for the entire week, I'm guessing that you'le be seeing Crappie pictures before next weekend. (5/26) On Lake Winnibigoshish, Joe Thompson, Four Seasons Resort says; "The walleyes have really responded to the warmer weather! Primarily due to the shiners moving in to the shorelines to spawn. The whole west side of the lake produced keeper walleyes this weekend. Many limits were caught. I had to convince a guy that we were not turning into Mille Lacs north and all you could catch were fish that were too big to keep! He went out that day and his party of three caught 18 nice walleyes under 17"! Jigs and minnows are definitely the ticket right now. Some bait shops have spot tail shiners which are working, but we have just been using fatheads and doing very well. The word is we will have shiners this week. The perch have been easy to locate. The problem is that they seem to travel together by size. It is no problem finding perch, the problem is finding nice big perch. Some of the better areas have been Sugar Point, Raven's Point, and Stony Point. Northerns have been showing up in along with the walleyes. Some fish between 24 and 30 inches have been biting the jigs and minnows. If you have been wondering when the best time to fish walleyes on Lake Winnie is, right now is the best time. If you have the time, we have the space. Our Condo special is still in effect, as is our midweek special. Check out our availability and give us a call." >> Joe Thompson, Four Seasons Resort . (5/26) From Lake of the Woods, Mike Kinsela, Border View Lodge; "The weather has been great with lots of sunshine. Fishing has been great as well. We are still seeing big fish come in and lots of slots being caught. No one location has been better than another. Some boats are in shallower waters lakeside of Pine Island from 8 to 13 feet of water and doing good, and some boats have moved out further and have done just as well in about 19 feet straight out from the Light House Gap. Both locations we have had to pick through some slot fish to get the eater fish. Gold has been the most consistent color. The water temp is still colder than normal, currently the river is at 58.8 near the surface, I am sure it is much colder the deeper you get. We are still catching some burbot which at this time we normally don’t see because the water temperature has warmed up. Due to the long winter and colder spring temperatures the water has not had a chance to warm up yet. It has been fun to catch these burbot as it gives you a different kind of fight. We have finally gone full speed ahead into summer. The temperatures from now until Friday May 30th will be close to 80 degrees and we may even break 80. Saturday then looks to cool just a bit and we stay in the mid 70’s for a few days. It looks like plenty of sunshine coming our way with just a few scattered showers." - 1-800-776-3474 Border View Lodge . 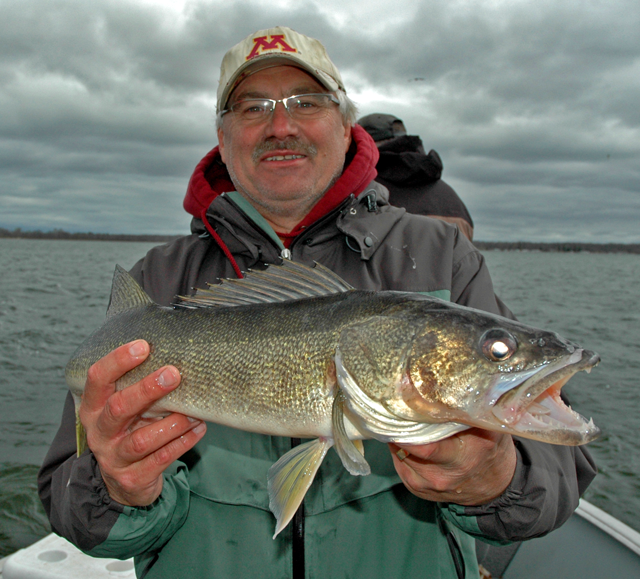 Fishing Report May 25, 2014 - Frustrated Anglers Get Sneak Preview Of Early Walleye Migrations. - After my fishing trip on Saturday (5-24) I compared notes with a number of my friends and we all had similar experiences. Walleyes were on the move and trying to keep up with them was tricky for most of us. Partially caused by heavy boat traffic, Walleyes were flighty, giving many anglers the impression that they "weren't biting". Once located though, they were catchable; the problem is finding a school of fish that will stay in an area long enough for anglers to dial in on them. It happened to me repeatedly on Saturday; after we'd locate some fish and hook a couple, the attempt to focus on that school of fish usually lead to a dead end. Even when we had lots of strikes on a drift, being allowed a second chance to drift through the same area was rare. With the spawning season over and nothing left on their agenda except feeding, Walleyes have begun roaming the flats in search of the best feeding opportunities. We anglers have the task of figuring out where they're feeding and when they're doing it. On the large Walleye Factories like Leech Lake, Winnibigoshish, Red Lake and others, spring migrations of spawning baitfish are high on the Walleyes list of favorite foods. The problem for us is that minnows can move and when they do, the Walleyes move with them. For now, we need to accept the idea that fish are where you find 'em and that finding a school of feeding Walleyes today, doesn’t necessarily mean that they will be in the same location tomorrow. During calm periods, walleyes have been spreading out horizontally across shoreline flats. Key depths are 8 to 12 feet and for me, moving the boat from shallow to deep water (or vice versa) was better than trying to follow any particular depth as I followed a breakline. Locating schools of fish can be a little bit frustrating. But picking them off one by one is possible and the best way to do it is to keep moving. Trolling speeds of up to 1.2 MPH are acceptable right now and that makes covering water a little bit easier. When the wind blows, the fish begin to bunch up on the shallow breakline again. On Saturday, afternoon whitecaps helped produce a little action in 6 to 8 feet of water. When they move back toward these shallow breaks, holding tight to the drop off by drifting or backtrolling will produce the best results. Surface temperatures are warming, but vary widely from on area to another. We found temperatures ranging from 56 to 62 degrees, depending on the location. Jig and Minnow combinations are still the preferred presentation, but Lindy Rigs with Leeches are producing some fish too. Spinners tipped with minnows should be kept in mind too, especially during calm periods when you need to search the flats for roaming fish. Remain the best for anglers fishing on most lakes in the Itasca Area. Except for the deepest, coolest lakes, spawning activity has wrapped up. We've caught a few male Walleyes that still show slight evidence of milting, but not many. Even though most Walleye are finished spawning, they still continue to linger near shoreline structure. Minnows like shiners, small Perch and other baitfish are beginning to push toward the shoreline for their own spawning migrations. The presence of baitfish will continue to hold the attention of Walleyes for another week, maybe two. For anglers seeking a "hot bite" selecting lakes where the weather conditions are most favorable has now become a key strategy. During spring, a sunny, calm day calls for a lake with darker water. The most notable example of a dark water lake that produces well during periods of calm, sunny weather is Upper Red Lake. The dark, bog stained water protects the sensitive eyes of the Walleye and also warms faster than clear waters do. Warmer water attracts baitfish, which in turn attract more Walleyes. On clear water lakes, it's unlikely that shallow, springtime Walleye will be active when conditions are too bright. The walleye's extremely sensitive eyes are just not suited for bright sunlight and clear water seldom produces great fishing when it's sunny and calm. When the wind blows, the situations become almost completely reversed. Now, the shallow waters of a place like Red Lake become TOO turbulent. Baitfish are blown out and away from the shallows and Walleye scatter across the expansive shallow flats. This is the time to fish on the clear water lakes instead. On these lakes, turbulence is the Walleye's friend. Current and darker conditions now give Walleyes a feeding advantage and their natural instinct to move forward into the current leads them toward shallow cover. While these fish are on the move, in search of baitfish, they are much more likely to strike your lure. On Bowstring Lake this Friday (5-23-14) we were treated to examples of both conditions. In the morning, a fairly strong breeze stirred the lakes surface into small whitecaps. We drifted shoreline breaks in 6 to 8 feet of water and enjoyed fairly good action. By noon though, everything changed. The breeze disappeared and lake's surface had been transformed into a mirror. Shallow water breaks still produced some bites, but there was a gigantic reduction in our fishing action. I attempted to counter the calm seas by looking for fish in deeper water, but they just haven't moved out there in large numbers yet. By mid-afternoon, we were kind of stuck. There wasn't enough time to switch lakes, even though that's what my instincts were telling me to do. This morning, I talked with a friend who fished Bowstring later in the afternoon and into the evening. By then, a gentle breeze and lower light conditions triggered a slightly better situation and they managed to scratch out their limits by about 8:00 PM. Jig and minnow combinations are still producing reliable results. For us, 1/8 ounce Lindy Jigs tipped with either Shiners or Rainbows produced equal results. If having Shiners is really important to you, then try and get some. But Rainbows or large fatheads will produce good results right now too. Surface temperatures spiked during the day, moving from 56 degrees at 10 AM, up to 65 degrees just before 5:00 PM. For today, a 20 percent chance of showers and thunderstorms before 8:00 AM. Mostly sunny, with a high near 80. South wind 5 to 15 mph. That should be almost ideal! A bit more wind and some extra cloud cover should come in real handy. With luck, I and my crew can get in on what has been a fairly reliable Walleye bite on Leech Lake where these conditions should be nearly ideal. Soon, You Will Know! Fishing Report May 23, 2014 - Bowstring Lake Walleye fishing was interesting on Tuesday. It was one of those days where you could catch fish, but paying attention to details is what made it happen. What made it interesting for me was seeing how everyone was paying attention to "different details". Whether it was the bait, the jig, the boat speed or the water depth, everybody had their own idea about how to maximize their effectiveness. From Brian Castellano, who was fishing on Bowstring Lake too; "Hi Jeff! Hope Bowstring was as kind to your boat as it was to ours today. I saw your rig at the south access. A buddy and I fished today from 9:00 to 3:00. It was slow going right off the bat, but luckily the wind cranked up and we found the walleyes on our 3rd spot up in the NE corner of the lake. 6-9' was the magic depth and having the right speed was critical. We caught the majority of our walleyes while we were backtrolling into the waves; we hardly had a bite while drifting. We used 1/8th oz. jigs and shiners. We had to weed through a lot of small northern pike to get our limits of walleyes. We also put a few nice sized perch in the box as well. Everything in Brian's report is good, solid information and for him, it helped him get the results he wanted, Walleyes in the cooler. • So here's the interesting part, We got our fish too, but almost everything I did to control my boat was different from the way Brian did it. Instead of the Northeast Side of the lake, we fished the Northwest side. Instead of trolling, I chose a controlled drift. Instead of fishing at 6 to 9 feet, we fished in 3 to 5 feet of water and instead sticking strictly with Shiners, we used a variety of presentations and all of them worked. So on the surface, it sounds like all you have to do is get out there, start fishing any which way you want to and before long you will be raking in the fish. But think about it, read a little closer and pick out one huge clue about what both of us had in common. BOAT SPEED! In spite of doing our own thinking and coming up with different ideas about where and how to fish, we both made sure to keep the boat under control so that the fish had time to find our baits and strike. I agree with Brian, backtrolling is a great way to keep the boat in the strike zone and moving at the right speed. Backtrolling is especially effective when fish are holding tight to a breakline and you want to be sure that everyone in the boat has equal time over their target. But with 4 lines in the water, backtrolling can get a bit crowded, especially if there's a cross wind that forces one of the lines under the boat. So for me, I opted away of backtrolling and chose a controlled drift instead. I think that "Slip Drifting" is actually a better term to use because controlling the boat is accomplished partly with my drift sock and partly with my tiller engine. When I'm looking for a fishing spot, I try to find areas where the wind is coming into the shoreline at an angle. That way I know that I'll be able to drift the breakline while keeping all 4 lines on the same side of the boat. Once I find the spot, I deploy the drift sock. That locks the bow of the boat in position and slows down the drift speed. Then all I need to do is use the tiller engine to control the depth and the drift angle. Walleye fishing with a jig and minnow allows some flexibility, but I usually want to slow the boat down to somewhere between .6 and 1.0 MPH. That's good jigging speed for the crew and the fish will tolerate the tension that they feel on the line, even at the higher end of this range. It takes a good drift sock to slow the boat that much, but in strong wind, the 60 inch magnum drift control sock will do it for my 20 foot Alaskan. There are calmer times though when the 60" magnum will slow me down too much. Then I use a smaller size sock that still allows me to control the boat angle, but without slowing the speed too far down. Click this link for a Video from Drift Control that will give you some more ideas about when and how to use drift socks. (5/23) New Fish ED Episode on Upper Red Lake - "This week, Fish Ed Host Jon Thelen travels to Red Lake in search of spring walleyes. 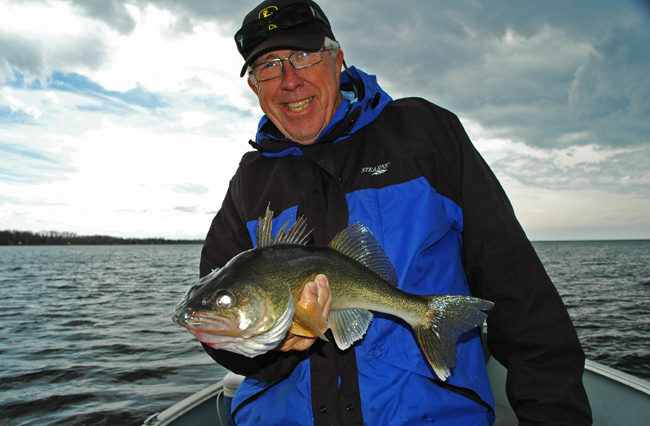 Lindy Fuzzy Grubs tipped with shiner minnows are the day's bait of preference for these hungry northern Minnesota fish. Check this episode out for tips and tricks that you can use on your next fishing trip. 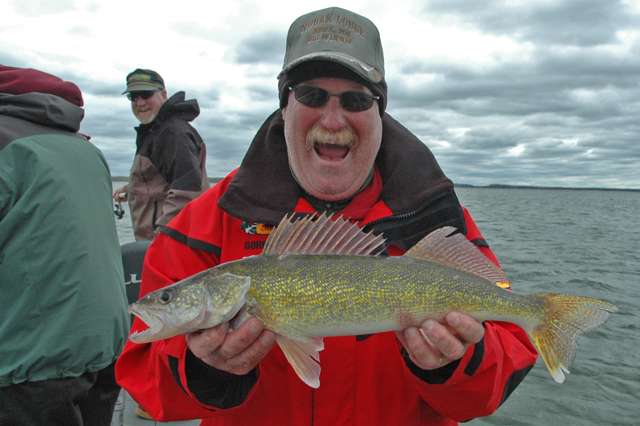 Click here for >> Fish Ed Spring Walleyes on Upper Red Lake . (5/23) Minnesota Anglers At Twins Baseball Games Get Discount Tickets and Free Hats; "Catch a Minnesota Twins game at Target Field and receive a free blaze orange and camo hat. People who have purchased a 2014 Minnesota fishing or hunting license can buy discounted tickets online at www.mndnr.gov/twins for upcoming home games. Once your ticket purchase is complete, pick up your free hat at Target Field on game day." Learn More >> Fishing and Baseball . (5/23) From The Iron Range, Greg Clusiau Warns, Deer Tick Season Is Upon Us; "Fishing until noon or so, it was really getting warm out and I knew the ticks would really come alive as we made our way back to the truck. They did and that’s when the twenty-two tick count came into play. I brushed as many off me as I could and continued to do so all the way home. Leaving my outer clothes in the truck, I had ticks living in there for a week or so. It got to the point where I didn’t even want to drive it anywhere. My neighbor, on the other hand, had zero ticks on himself, as he treated his clothing with ..." >> Read Greg's Full Report . No natural items enter a lake and no natural items leave a lake (aside from fresh fish removed from any water). All weeds, mud, muck, etc to stay at the lake it originated. (By the way, a fish in a live well filled with water going down the road is actually two citations). A trick I use for saving $$ on minnows is to take a gallon milk jug, fill it halfway with water and freeze it overnight. Before going out to fish, fill the other half with water and leave in the truck. When exiting a lake, drain the lake water used for minnows, and replace with the cold water from the jug. By the way, a few years ago, I wrote an article "Keep Your Bait Alive (and still be) Minnesota Legal" about safe ways to transport your minnows legally. For a more in depth look at some of the ways you can stay ahead of the Zeebs ... take a few minutes to check it out. Just in case it doesn't seem real important right now, maybe clicking here to see the picture that I received from my friend Tim Duda who has a cabin on Sand Lake will help convince you. >> View Picture . Yes, you're right, those are Zebra Mussels and they're right here in our own back yard. If you want to help avoid taking Sand Lake Zebra Mussels to the rest of our favorite lakes, click >> Keep Your Bait Alive (and still be) Minnesota Legal . Fishing Report May 22, 2014 - Big Walleye Lakes and Feeding Migrations - Large "Walleye Factories" like Leech Lake, Winnibigoshish, Red Lake and others are all producing good numbers of fish. 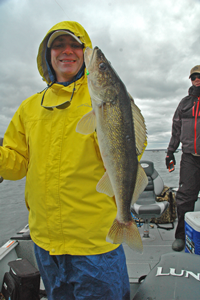 (5/22) On Leech Lake this Wednesday, an overcast, breezy day helped kick Walleyes into the feeding mood. Although the fish feeding and strike agressively, they are still widely distributed around the shoreline so finding a "hot bite" is tricky. But when you do find a small school of fish, they will bite. The best approach right now is to plan on covering a lot of water in the 6 to 10 foot depth range. When you encounter areas where baitfish are present, there will be Walleyes nearby. For us, Walleyes were much more agressive on the breezy side of the lake. But we did scratch a few fish out at almost every stop, even on the calm side of the lake. Jig and minnow combinations were definitely the preference today. Shiners outperformed Rainbows, but there were plenty of fish caught on those as well. This time, artificial tails produced very poorly in the morning, but did begin to trigger strikes later in the day. If you plan to fish on Leech Lake this weekend, take the extra time to track down a supply of good size minnows. Don't worry if you can't find Shiners, Rainbows or large Fatheads will work too. Post Spawn Walleye migrations into Winnibigoshish are mainly wrapped up. Surface temperatures are moving into the mid 50's and that is beginning to trigger early migrations of Shiners and small Perch into the shallows. By the time that our guests arrive for the Memorial Weekend, schools of feeding Walleyes will be on the move. (5/22) From The Marcell Area, Frontier Sports, Paul Larson said; "Fishing in the area lakes has been slowly improving. With the brunt of the attention being paid to lakes like Bowstring, Cut Foot Sioux as well as the river, many of the smaller lakes that opened up first, are warming up and Pan fish are working their way into the shallows. Crappies are being caught now in the shallow bays and a few walleye off shoreline breaks and shallow humps, but it’s been tough going. Water temps on some of the larger deeper lakes in the area are between 43 and 47 degrees. Still cold but with the promising weather forecast for this weekend, things should improve greatly. We are looking forward to a great weekend. The bait shop and the gift shop are fully stocked and ready to go with a lot of new items. The bait and tackle shop has a newly expanded Musky tackle section this season. Be sure to drop by when you’re in the area." Frontier Sports features a complete and fully stocked Sporting Goods department and Bait Shop, Gas, Grocery, Deli and Gift Shop. Frontier Sports is an authorized LIVE TARGET and SAVAGE GEAR dealer." Frontier Sports 219-832-3901 or Email . (5/21) From The Bemidji Lakes Area Guide Service, Paul Nelson wrote; "Lakes in the Bemidji area continue to warm slowly with the cold weather and rain. Most lakes are still in the upper 40s, which is slowing down the post-spawn recovery of the walleyes. There are usually more male walleyes than female walleyes in most lakes, so some male walleyes will end up hanging around the spawning sites long after all the female walleyes have spawned. Jigs and shiners have been the most productive bait for walleyes, but anglers can also use fatheads, chubs or small suckers to catch walleyes when shiners are unavailable. The smaller minnows work well with jigs, while anglers using larger minnows may be better off fishing them on live bait rigs. The walleye bite should continue to improve as surface water temperatures exceed 50 degrees. 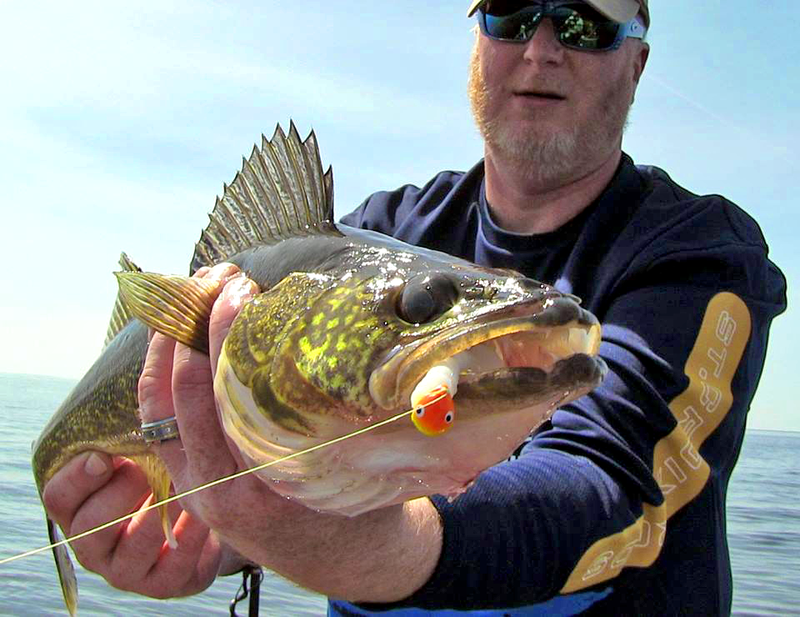 Anglers have been catching more male walleyes than female walleyes early in the season, but the female walleyes will bite if anglers can locate them and put the right presentation in front of them. The long winter killed off most of the weeds in the lakes, so any areas of new weed growth are particularly attractive to both baitfish and gamefish. Walleyes in some lakes have also been holding on areas with rocks. 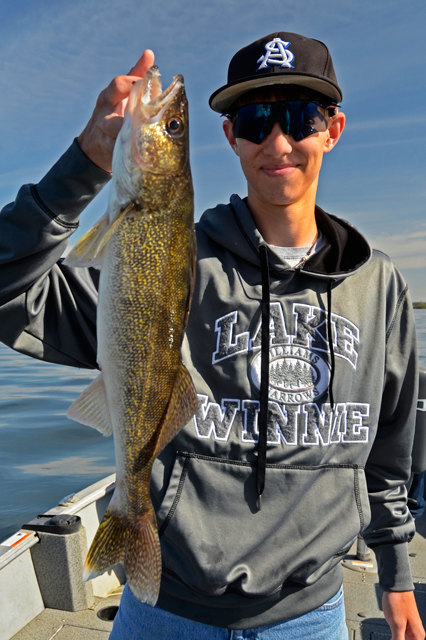 Most anglers have been finding walleyes in 5 to 8 feet of water, but depending on wind conditions and water clarity, anglers may find fish shallower on windy days or on stained lakes and deeper on calm days or on lakes with very clear water. (5/21) Grand Rapids Area Fishing Guide Nik Dimich; "Whether you live here, have a cabin here or are visiting or vacationing here in the northland, one thing we all should remember is that we have access to world-class fishing for walleye, northern pike, panfish and largemouth and smallmouthbass right here and around Grand Rapids, Minnesota. And one of the best times of year is coming up - Memorial Weekend. (May 2014) Ultimate Fishing Experience; "Check out our brand new TV series: The Ultimate Fishing Experience. Each week, follow experienced Lund guides and pros on their fishing adventures throughout the lakes and rivers of North America while educating viewers on items such as rigging, fishing techniques, electronics and more. In this episode, boat control techniques that will help you put more fish in the boat this summer. Drifting for Waleye with Tony Roach, back trolling for deep weedline Crappies with Dave Csanda. Alex Kessler shows how to troll crankbaits for big Walleyes and James Lindner holds tight on deep weedline bass. 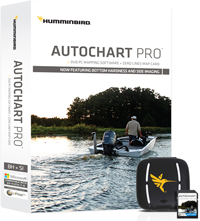 Click to view >> This Week's Fishing Video >> Better Fishing Through Boat Control . 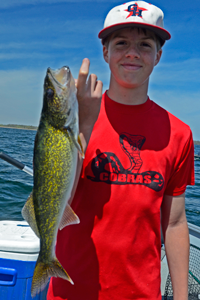 Fishing Report May 20, 2014 - A Promising Day For Walleyes. - After spending the weekend under blue skies and sunshine, Monday's harsh wind was a little bit too much for me and my particular crew. I have always said that you can't leave the house without learning something and on Monday, I definitely learned "what not to do next time"! Luckily, today's weather forecast looks a lot more apealing. Walleye chop, slight chance of rain and a crew that knows the ropes inside and out. I'll be heading for the lake with a spring in my step today! 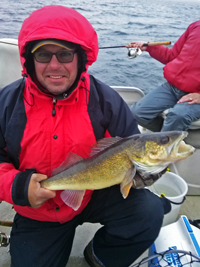 (5/20) On Lake Winnibigoshish, Joe Thompson, Four Seasons Resort says; "The walleye fishing has definitely improved in the keeper size category. 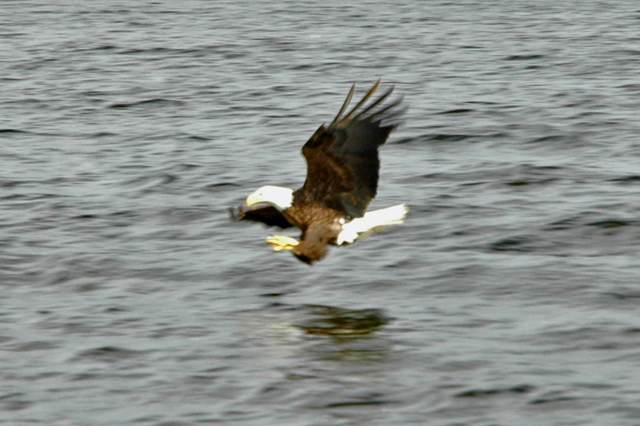 The smaller males are being found up and down the west side of the lake. We are more in the mode of fishing where the favorable winds are now, rather than having to target a specific area. Raven's Point, Sugar Point, Stony Point, and The Birdhouses have all produced walleyes this past weekend. Perch continue to be in the shallow water spawning. Some really impressive catches of perch have been coming in. Stony Point, Sugar Point and ..." >> Joe Thompson, Four Seasons Resort . (5-20) From Upper Red Lake, Reed Ylitalo, Wings and Walleyes Guide Service wrote; "I got the chance to take out 2 guys that don't get to fish all that much and boy fishing was a blast on Red lake. We went out of west winds and went south about 1.5 miles. Best fishing was in 6 to 7 feet of water with a jig and a rainbow chub. When the sun was out at the end of the day we seen the water temp hitting 50 degrees. The walleyes and the bait fish were on the move and the fish were extremely aggressive when you found a school of them. Sunday May 18th Lake Winnie was a long day tell the sun hit the trees then is was game on said buddy of mine Grant Prokop! He was fishing the windy side of the lake on the first break line on the edge of the sand grass. The sun hit the trees and the bait fish were on the move to shallow water and so were the walleyes. Fishing was good in 6 to 8 FOW with a blue and orange jig tipped with a fat head minnow. "Reed Ylitalo, Wings and Walleyes Guide Service . (5/20) From Bowstring Lake, Geiger's Trails End Resort; "The fishing was great the week of Fishing Opener 2014. However, the last couple of days have slowed up a bit. The walleye are done spawning and looking for permenant residence for the summer months. They were shallow, but will be on the humps within the next few days. High winds today and tomorrow may keep them shallow, but we are sure they are heading for deeper water as the water temps warm up. It will be interesting to see how this unfolds within the next week. Be advised that we do have cabin rental openings for the Summer. Please check our website for more specific information. We carry Perch Chubs, Crawlers and Leeches for the fish feeding frenzy. For the people pleasures, we still carry Pizzas, Pop & Water, Ice and Ice Cream treats. NEW to Geiger's Trails End Resort... A Pontoon! 20' Sweetwater with a 60hp Mercury 4 Stroke! We will start taking reservations soon. Call for details. - See you on the water". - Bill & Erin Charlton, Trails End Reosrt . (5/20) From Bowstring Lake, Darv Oehlke, Bowstring Shores Resort says; "Fishing Has been great on the walleyes. 6 to 9 feet. Fat head minnow and Jig. Also the Rock pile has been giving up some big fish. Perch in the same depth along with the walleyes. leaches are starting to work well also. Lot of fish being caught on Bowstring". Darv Oehlke, Bowstring Shores Resort. 218-832-3101 . (5/20) From Cutfoot Sioux and Lake Winnibigoshish, Eagle Nest Lodge; "After a very close call with ice out, we had an opener! And the fishing on Big Cutfoot Sioux was fantastic! Lots of big fish caught...mostly in the slot. But the boys sure had fun catching them! This weekend, the fishing was a little slower, but there were lots of keepers caught. So hungry fishermen were happy. The weather forecast looks better, the spot tail shiners should trap, and Memorial Weekend might be the best time to be here this spring! We have openings, too." Take care, Bryan and Sue Harris, Eagle Nest Lodge 218-246-8701 . (5/20) From The Bemidji Area, Matthew Breuer, North Country Guide Service; "The report hasn’t changed much since last week. Most of the fish are still pretty suicidal once located. Guys are mostly fishing the sand and finding good numbers of post-spawn fish, while others are still finding spawners in the current. Jig and minnow is still the method of choice. Crappie fishing never really took hold in the north country, but for people after them, now’s the time. With the late spring they took a back burner to the walleye opener, with it being so close to ice out. The fish are stacking up in bays and on mucky shorelines, feeding heavily in prep for their upcoming spawn. Jumbo perch shouldn’t be overlooked either, as they are feeding heavily, and can be found mixed with walleyes on the sand, especially in areas where sand grass is present". - Matthew J. Breuer, Northcountry Guide Service (218) 444-6479 . (5/20) From Lake of the Woods, Mike Kinsela, Border View Lodge; "The weather on the weekends has been perfect! We had another week of big fish and slot fish being caught and released. The keeper fish are a little slower. However, everyone has had a blast with the amount of fish being caught. The current is really moving so using 1/2oz jigs or heavier have been the best. The hot colors have been gold, pink and white glow. The ice pack is still keeping boats in the river and four mile bay and on occasion just outside the light house gap. We hope the ice pack is soon to be gone or at least wind out of the south to allow more availability on the lake. Also there is a lot of debris right now with the opening of the dam that happened Saturday so be cautious as you travel the river and four mile bay. The temperatures are climbing rapidly. Monday Tuesday and Wednesday will be in the upper 50’s. Thursdays forecast is 69 degrees and sunny. Friday through Monday will be in the mid to upper 70’s with a chance of isolated storms on Sunday. All in all looks like the week ahead is going to be perfect for fishing!" - 1-800-776-3474 Border View Lodge . Fishing Report May 19, 2014 - Leech Lake Not Ready For Prime Time? - "Spotty" is the best word that I can use to describe the fishing on Leech Lake these past few days. Experts who fish Leech Lake frequently, along with some of the better fishing guides and avid anglers who have the knack for tracking down fish are doing okay. For them, the Walleyes have been fairly cooperative. But I don't think that any of them would call it a hot bite, at least it wasn't over the past weekend. If you the fish the lake, then you already know that it's a good idea to take everything I'm saying this morning with a grain of salt. 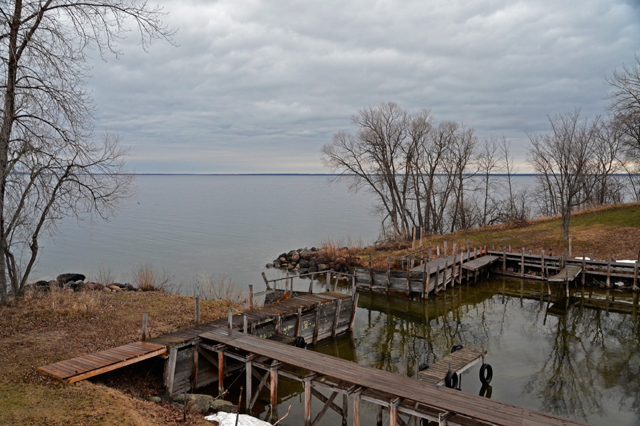 That's because it's hard to make a judgment about Leech Lake based on what we saw yesterday. This great fishery is fickle, she's always had a thing about being stubborn inder certain weather conditions. Calm seas and sunny skies are not ideal for fishing this lake and those were the conditions this Saturday and Sunday. Wanna see her in a better mood? Then bring on the Walleye Chop, cloudy skies and a heavy breeze are likely to make the Walleyes start to bite like crazy. But on Sunday, we saw very few fish caught. First hand reports from friends confirmed my belief though, no matter how the bite "Seems To Be", somebody always catches fish and like always, there were fish caught, the action just wasn't fast. Walleye fishermen who did well over the weekend were fishing shoreline breaks in 8 to 10 feet of water. Jig and minnow presentations account for 90% of the effort, which leads me to another thought about the lake. Leech Lake can be fickle about bait too. In fact I can remember like it was yesterday, the first time that I ever fished on Leech. It was in September of 1987 and for me, it was a really special occasion. There were lots of famous fishermen involved and one of them insisted that he would not go there without Shiners. Luckily, I followed his lead and drove a long way to get some because once we were on the water; the only anglers who succeeded were the handful who took the drive to get those Shiners. When one of those famous "fishless fishermen" pulled up alongside me and asked how we had been doing, I told him. He asked; "You Got Shiners?" I said yes. He shrugged his shoulders, grinned and said; "That's how it goes, sometimes ya just gotta get the right bait". Fast forward to yesterday; Thanks to the late spring and subsequent Shiner Shortage, most of us do not have the most consistent bait for Leech Lake right now either. In fact on Sunday, not only did I not have Shiners, but I couldn't get my hands on any Rainbows either. Knowing that I was at a serious disadvantage, before we even arrived at the landing, I had already told my pal Marty that we'd be better off using artificial bait for the Walleye and Pike. If we would happen to find a school of nice size Perch, then we'd use whatever minnows that I did have on hand. 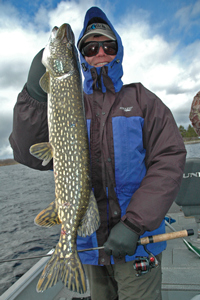 On Leech Lake, Walleyes and Pike are both susceptible to soft plastics. Depending on the water depth, an 1/8 ounce or 1/4 ounce Lindy Jig tipped with a 3 or 4 inch twirl tail, a 3 inch Money Minnow or one of the many shad type action tails will do the trick. On Sunday, an 1/8 ounce jig tipped with a 3 inch shad body accounted for almost every fish we caught. The exception was when we casted for Pike using the 5 inch Money Minnows. They accounted for some Pike and a Bass that wandered into the wrong territory. 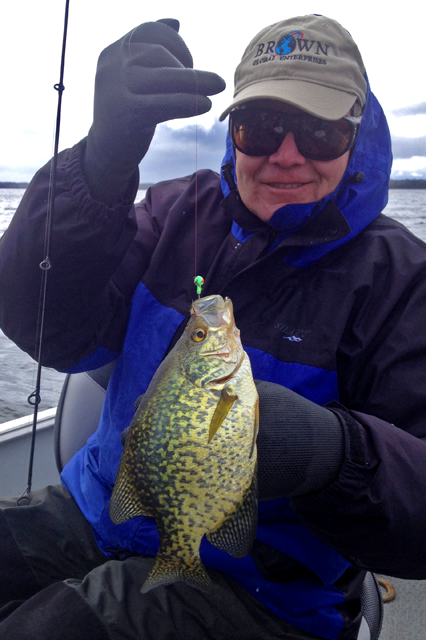 There were a dozen or so Crappie fishermen on Leech Lake gathered in some of the typical spawning locations. Shallow water near the Bulrush patches. We watched them as we casted for Pike, but didn't see any fish caught. Judging by the lack of activity in the shallow water, I'd say that we were all just a little bit too early for the party. Leech Lake may not be ready for prime time today, but I'd guess that a week of warming temperatures and we're going to see the action improve. (5/19) From The Iron Range, Greg Clusiau wrote; "Gathered together at the Little Bear Lake fish camp, Chad Peterson and Tom Batiuk joined me in the search for shallow water ice out crappie action. Peterson drove all the way from Alexandria, Minnesota and Batiuk from Ft. Frances, Ontario for some fishing fun in northern Minnesota’s Itasca county. I brought along the big boat for larger waters, just in case, but we ended up fishing out of smaller crafts, like Tom’s old 14' aluminum and my brother Bruce’s 15' Grumman sport boat. 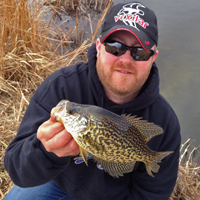 Small boats were dragged back in the bush to some proven ice out panfish honey holes and ..." >> Read Greg's Full Report . (5/19) From Wired2Fish; "When we're Pike fishing with jigs, we are always worried about having our jigs snipped off. Wire leaders are fine, but then we have to worry about other more finicky fish who won't take the bait when they see the leader. The answer is to use a flurocarbon leader attached to your fishing line. Take a tip from Bass fishermen who are always playing with fishing knots and say; "Good line and a good knot are the most critical components in how you fish for bass. You can often get away with cheaper lures, rods and reels. But cheap line and bad knots will mean a lot more lost fish and a lot more frustration in your fishing. Don’t skimp and take your... Click To View Video >> Seaguar Knot Great For Leaders . A note from Wayne Crandall Says; "Hi Jeff, Wanted to share this photo with you it is my biggest Northern to date I caught it on a jig and minnow walleye fishing. Not sure what something like this would weigh my guess was 27 to 30 pounds it swims to fight another day. - Wayne Crandall . Thanks for the photo Wayne! That's one thing that I love about fishing on Upper Red Lake. You never know when one of those giants is going to move in and snap your bait. Here's a formula that many anglers use to figure out the weight of a Northern Pike using the length and girth measurements. 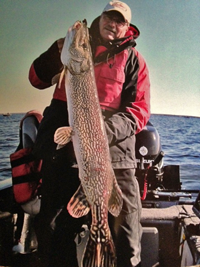 Here's an example using a 40 inch pike, with a girth of 22 inches. First, figurre out the square of 22 (22 x 22 = 484) and plug that number into the girth space. Use the shape factor of 1000 for Northern Pike. 40 x 484 = 19360 / 1000 = 19.36 pounds. So now just plug in your own numbers and you'll have a good estimate of weight. Good Luck Out There!! 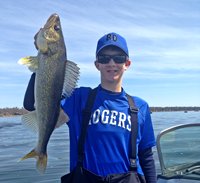 Fishing Report May 18, 2014 - Walleyes Are On The Move. Upper Red Lake was was a friendly place to be on Saturday. There was a bumper crop of anglers, but weather, fishing and good manners combined to make it a great day for most of the fishermen who visited the right areas. The exception to all of the good fishing reports was that the anglers, including me, who visited the North side of the lake did not find too much to smile about. I'll never figure some of this stuff out. 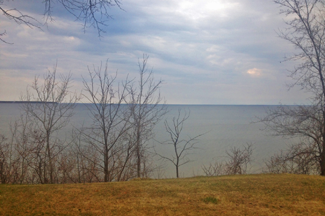 It's like the lake had a split personality yesterday. The North side was chilly, choppy and void of fish. The South side was warm, calm and teaming with life. It only took about 5 minutes for the day to brightern up for I and Marty Glackin after we reluctantly made the long run from the Rocky Point area South to Rogers. The classic Walleye chop that failed us up north had been replaced by calm, sunny water on the down south and the fish were loving it. The stretch of water all the way from West Wind to Rogers was filled with boats, most of them catching fish and some of them catching LOTS of fish. Early in the day, key depths were 5 to 8 feet and stretches of gravel and rock were prime targets. Later, as they water warmed, the pattern shifted as Walleyes followed baifish as they grouped tight along the shallow breakline. During late afternoon, fish were still available in deeper water, but the sweet spot for me was 3 to 5 feet of water. Our presentation shifted in the afternoon too. By 2:00 PM we had completely forgotten about using live bait and were throwing 100% artificials. Lindy Jigs, 1/8 ounce tipped with 3 inch Ripple Shads were ideal. We jigged them agressively as I moved the boat along the breakline and when the fish hit them, they smoked 'em. No finesse required. I could see the clouds of baitfish building on the Humminbird and while I was jigging, I snagged my first Shiner of the season. That means that the minnows were moving shallow and that will be good news for bait dealers. Another new development on Saturday was that Marty picked up 2 Sheepheads, also the first of this season for me. After our trip, when I arrived at Deer River, reports from the fish cleaning shack about both Winnie and Leech were good too. Winnie and Leech Lake were both crowded, but the fishing was good in spite of the traffic. We are heading in the Leech Lake direction today, so I'll have some first hand information about that for tomorrow morning. Fishing Report May 17, 2014 - Walleyes Are On The Move. Ready for a really good fishing week? Good because Walleyes have already begun responding to the warming trend that began moving our way on Friday. I have to admit, it caught me a little bit by surprise, but yesterday, one particular stretch of shoreline really came to life. I was surprised because we had just checked the same spot on Thursday. It was beginning to show signs of life, but was still nearly vacant and far from a fishing hot spot. From what we saw, I'm guessing that there are still lots of fish located further up some of the small rivers because this migration included waves of Large female Walleyes. They were moving along a mile long stretch of shoreline located near the mouth of a river, well known for spawing activity. In this early wave of fish, there was almost no evidence that smaller male fish had begun to travel the same route. In fact, throughout the day, we only caught 2 or 3 fish that we knew for sure were males. Also, we did not get a single fish that was smaller than the protected 17-26 inch slot. That's right, not a single keeper, only picture takin' fish. These fish were feeding so agressively, that there's no doubt, if male fish were present, they'd have been agressive too. Sunshine and warmer air temperatures helped force surface temperatures to begin creeping back up. By day's end My Humminbird showed surface readings in the 48 degree range, still chilly, but improving. As the surface temperatures continue to rise, baitfish will begin showing up in larger numbers. That should help trigger additional movement of smaller fish as they realize that spawning season is over and it's time to get something to eat. Key water depth was on the shoreline break at 6 feet. We were more productive when we backtrolled slowly, than when were were drifting., but either method worked. Our presentation was simple, 1/8 ounce Lindy Jigs tipped with a hodge podge of minnows, Rainbows, Fatheads and a handful of shiners that I had left over from the day before. We were snap jigging fairly agressively and the fish responded well. (5/17) From Kip Lindberg; "Are you finding it hard to find minnows (spottail, rainbows) up north? I am headed to Leech Lake, and just curious if there is a shortage and what bait shops you know will have live bait. Love your website. Very insightful! Cannot wait to get on the water this weekend." A) Kip, Generally speaking finding Rainbows and Fatheads hasn't been a problem. The Spottail Shiners haven't begun running in great numbers though. 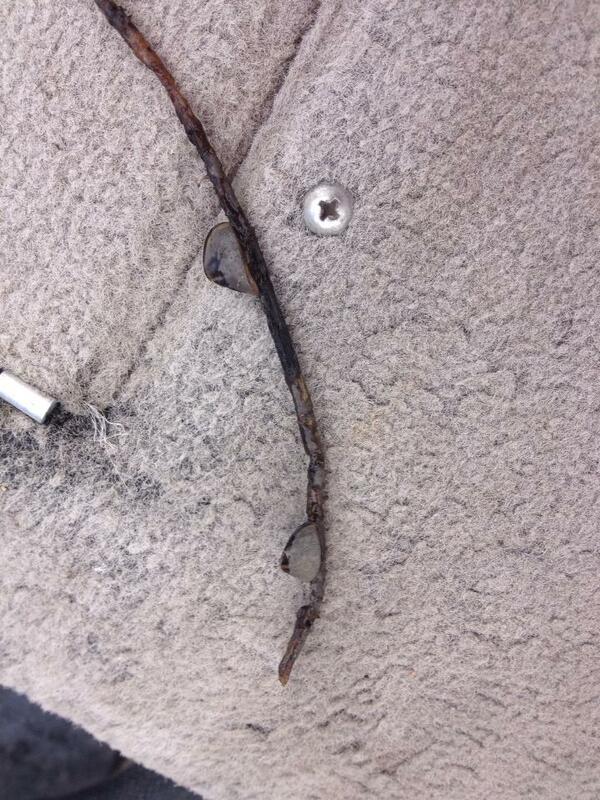 Bait dealers are finding some, but the supply is very weak and subject to change by the hour. Luckily, the fish are feeding agressively and both Rainbows and Fatheads are producing very well. In some situations, artificial tails are producing too and as a backup, I've been carrying a variety of plastics and using them whenvever I can. Fishing Report May 16, 2014 - Cold Temperatures Chill It, But Don't Kill It. Walleye Action Remains Good. (5/16) On Upper Red Lake this Thursday, the water temperature at the Tamarack River boat landing was 43 degrees. On the main lake, temperatures ranged between 44 and 46 degrees and didn't change throughout the day. For the first couple of hours, fish were sluggish, but they were catchable. The most notable difference from my trip up to Red on Monday was that Walleyes were now scattered on the flats instead of holding tight to the breaklines and gravel patches. That scattering had created a certain randomness to locating the fish, making it seem like they were harder to catch. But in reality, they were still catchable, there were just longer gaps between encountering them. During mid day, Walleyes began re-grouping and scattered packs became small schools of fish, small schools turned into larger ones and eventually, everything was almost back to normal. Male fish continue to show strong signs of the spawning influence, most of them milting heavily when brought into the boat. Larger female fish were few and far between. The ratio of keepers vs protected slot fish was about 5 to 1. That made easy work out of gathering fish for the crew to take home. By mid afternoon, conditons were warmer, winds were lighter and the crowds were building. With a forecast of much improved conditions on the horizon, I expect that Red Lake action will continue to hold for the weekend. But be prepared for larger crowds on the lake and longer lines at the boat ramp. Remember too, the liklihood of of a visit by the DNR Conservation Officers will be high this weekend. So make sure that your fishing trip will be a fun one by having all of your regulatory ducks in a row. (5-16) On Bowstring Lake, Reed Ylitalo wrote; "Bowstring has been pumping out great numbers of keeper walleyes in 4 to 10 feet of water. The bait that has been working on Bowstring is a jig and minnow. Big Cutfoot Sioux has been absolutely phenomenal. There have been more 17 inch and under fish showing themselves in the cleaning shack. Water temperature is still chilly we have been finding a lot of fish in 6 to 10 feet of water. The best bait on Cutfoot has been a 1/8 oz jig and minnow. Whether you have spottail shiner's, rainbow chubs or fatheads, they are all working. We are looking forward to some warmer weather and warmer water temperatures. As soon as we see some warmer temperatures the males are going to be showing themselves more and more each day. Happy fishing and good luck!" Reed Ylitalo, Wings and Walleyes Guide Service . (5/15) From Bowstring Lake, Trails End Resort;"We had a great opener, lots of fish caught. 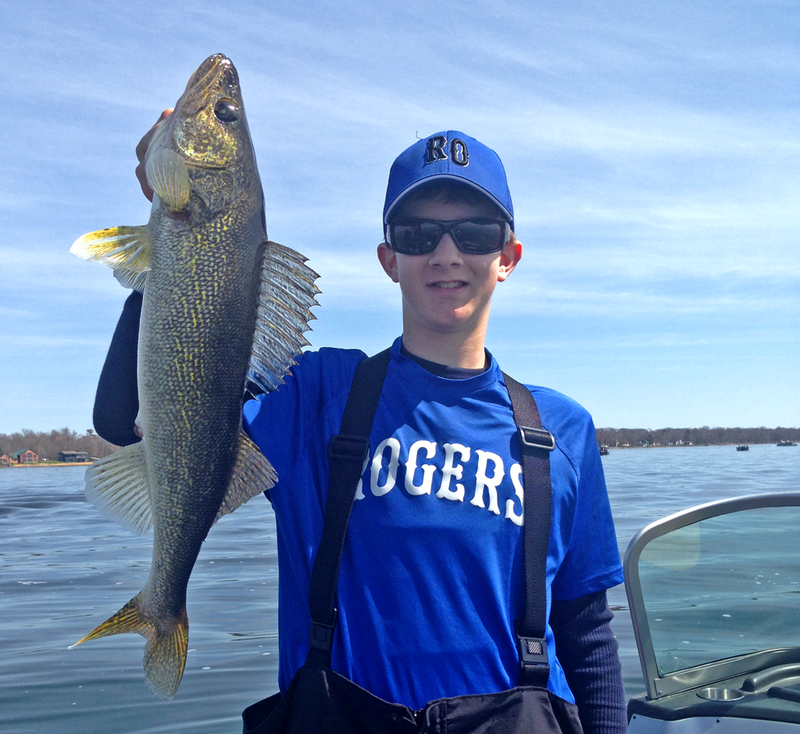 Walleyes were still spawning" >> Geiger's Trails End Reosrt . Rolling away from the fishing dock with outside air temperatues in the mid 30 degree range probably isn't what any of us were dreaming about last winter. But I can't say that there would have been a better time (during the fishing season) for this cold front to strike. Thats because the good news is that the impact on water temperatures wasn't all that problematic. Ever since the fishing opener, they were holding in the mid 40's, they were already cold. So the wintery teperature drop didn't reduce surface temperatures that much. Since the surface water had barely crossed the 50 degree mark anyway, the affects of this front amounted to a couple of "slow start" mornings, followed by good midday recoveries. 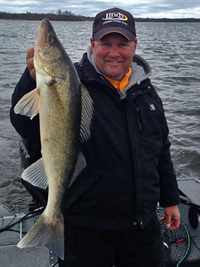 (5/15) From The Marcell Area, Frontier Sports, Paul Larson said; "The opening weekend, was hit and miss on Saturday but Sunday was very good on some of the area’s better Walleye lakes. Reports of female walleye that hadn’t spawned yet were quite common and with the cold water temperatures, the fish were sluggish for the most part. But that was Saturday. Reports of good catches on Sunday were welcome news. The old standby jig and minnow combo was the ticket. Crappies are mostly out in deeper water but there have been a few reports of fish moving in shallow. All in all it was a good weekend and fishing will only get better as the season progresses. The shop is fully stocked and ready for this weekend. Be sure to stop by when you’re in the area. (5/15) From The Ottertail Area, Ross Haggemeister wrote; "Here we go. We’ve launched into another walleye season. The walleye fishing reports in Ottertail Country came slowly this weekend. Normally when fishermen do well, reports are easy to come by. Anglers plugged away all day Saturday desperately trying to catch something worth reporting. By mid-day Sunday, some reporting was occurring but still not much. It seemed many pridefulwalleye enthusiasts struggled, and quietly drove home Sunday to spend the day with their moms—a wise choice by any virtue. All in all, the walleye populations in the Ottertail County area continue to thrive after very little harvest this weekend. Sunday was stronger then Saturday, which is normal as some anglers put a pattern together. It seems the greatest struggle was not necessarily the walleye or lack there of, but more so a lack of shiner minnows. Shiners are ready to come to the shorelines of our area lakes and spawn, but the water temps have them situated away from shore and are, therefore, inaccessible to anglers and bait wholesalers alike. Walleye and other predators on most Ottertail Country lakes eat perch, young panfish, and shiners early in the season. We can’t use panfish and perch for bait, so that leaves shiners as the bait to have/buy/use. Without that valuable minnow in hand and on hook—it’s very difficult. 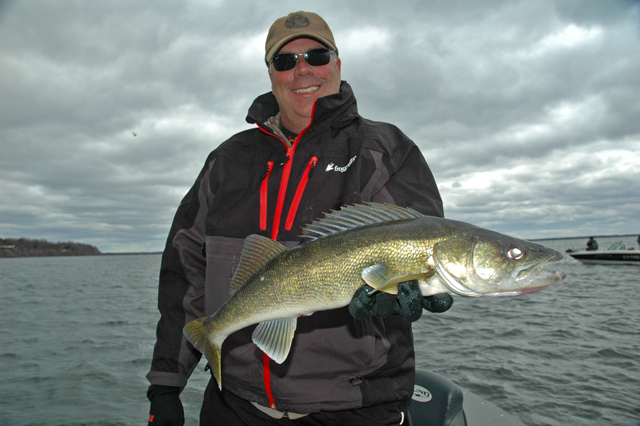 Most boats this weekend had about 3,4, or 5 walleye per boat on Saturday—that I surveyed. Had they had shiners, they probably would have tripled those numbers. The water temps on nearly every lake in the county are 45.7–48.5. The shiners won’t come to shore until the sun comes out and warms the water. Once walleye angler get these minnows, the fishing will certainly pick up. I imagine that will happen no later then Thursday/Friday this week, which is good news to fishermen this coming weekend. The panfishing on area lakes and shallow bays continues to be stalled by the crappy weather, but is sure to really get good as soon as the sun stays out for more then a day. My best panfishing, so far, has been in deeper bays as opposed to shallower ones, and it’s going to be at least two weeks before we see “shoreline" action for panfish, because the main lake and lakes that don’t have bays need more time and less rain fall to warm enough to get the sunnies and Crappies in. As for the walleye fishing “how to”: the fish are very scattered and tough to pattern even with shiners on the line. Try deeper areas first because it’s easier to “mark” and locate fish on electronics in deeper water. If you struggle to find fish after looking and fishing on 7 or 8 spots, then they’re probably in a different depth zone. Try shallow next 8-12 ft, and then very shallow shoreline-8 ft. And if those areas don’t work, try another lake. Live bait rigging is a strong and safe bet right now—just watch your boat speed. Keep it around .2—.8 mph most of the time. For jigging, try two ways: stay very vertical and use small jigs 1/16-3/16 in all depths, or try 1/8 jigs in a more or less horizontal fashion as you troll 1.1–1.8 mph in shallow water ( you need a lot of line out). I’ve caught walleye an all of those methods so far, so they are working. Slip bobbers are also a strong bet right now. Don’t forget about shore fishing. It doesn’t get better then right now to stand on a bank and catch walleye, and Ottertail Country has a huge selection of productive shorelines and river mouths, and current areas to chose from. Good Luck in Ottertail County this week—it’s going to be a good one! By, Ross Hagemeister, Meister Guide Service (218) 495-3140 or Email . 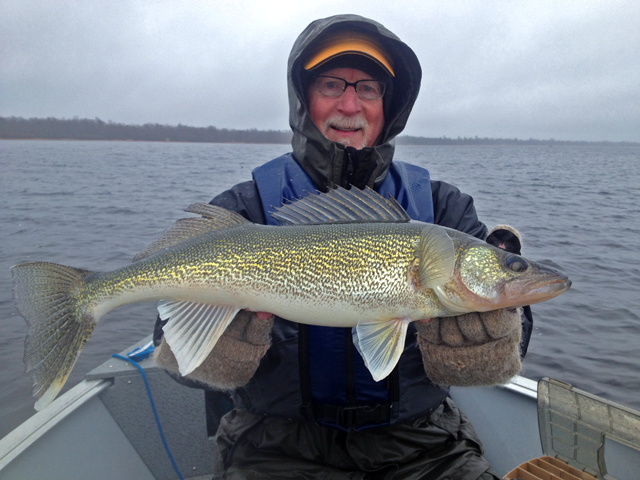 (5/15) From Lake of the Woods, Mike Mayer at Wheelers Point Resort had this report; "Fishing has been unbelievable so far this year on Lake of the Woods. The numbers of slot fish and trophy fish (over the 28 in slot limit) are unreal! People are catching 3 or 4 "fish of a lifetime" in an afternoon. The big females are still up shallow and in the river. Most have spawned out now, but are still feeding. Most fish are being caught in less than 15 feet of water with a lead head jig and shiner (either live or frozen) being the most popular method. The ice is still on the main lake, but there is enough area (depending on wind direction) to get outside of Pine Island and fish the main lake shoreline. The area outside of the gap, right in the gap, and several areas in the river are all producing lots of big fish right now. Weather forecasts for the weekend look favorable and should result in some fantastic fishing on Lake of the Woods." Mike & Sheila Mayer, Wheelers Point Resort & Lodge 800 542 2435 . (5/15) From the Bemidji Area, Fishing Guide Matt "My wife was helping a friend on Sat. morning, so our group of 3 didn't hit the water until 1pm on opening day. It took us a bit to find a school of fish and to shake off the rust, but once we did it was pretty solid. Managed our 18 fish, with 2 over 20". Ended up being a pretty nice day despite a little chop. We found all of our fish hanging around bars, and they seemed to be lake spawners. Fish were caught in 18-21' of water for the most part... We were the only people on the lake for the last few hours. It was wonderful. Sunday we went to bigger water and still fished alone most of the day. We once again filled the limit of anglers in need, but no bigger fish. All solid 15-19" fish. Completely different bite, as we fished 7-9' of water on sand/sand grass. Monday I guided a group for a half day and they were able to capitalize despite some really cruddy weather. Temp. had dropped 20 degrees and it was spitting rain all day. Again, a couple limits and 3 fish over 20" all caught in 7-10' of water again on sand/sand grass. Nothing huge over the weekend, but some really solid fish. A lot of males were still milking when reeled in. On Sat. my boat was covered in it... Golden or spottail shiners worked, didn't notice a huge difference between the two like I do most years. 1/4oz. jigs were the mainstay, blue and pink dominated." Matthew J. Breuer, Northcountry Guide Service (218) 444-6479 . 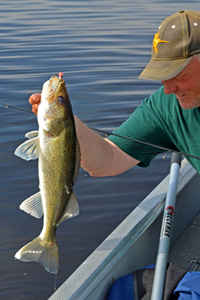 Fishing Report May 14, 2014 - Migrating Walleyes Pose Dilema For Walleye Fishermen. The beautiful thing about having any theory is that sometimes you get to be the Guinea Pig and test it on yourself. Like my theory about trying to catch keeper size, post-spawn Walleyes on lakes that have "protected slot size limits". If catching smaller, keeper size male fish is your goal, you have to leave the area where you're catching "slot-fish". That's right, just quit courting the ladies and seek out the location of the nearest boys club. We proved that theory again on Tuesday when we discovered one of the travel corridors that that was being used by a school of post spawn females as they were migrating into main lake structure. You can beat your head against a wall all day long, but these girls are travelling together and once you start catching them, they are almost all going to give you the same treatment. You can have a gorgeous snapshot, but few, if any will be going home with you. Here’s what’s going on; most of the female fish have already moved into spawning territory, dropped their eggs and moved out. They are done and they’re not going back until 2015. But the male fish, they are still lingering in the spawning territory hoping to have just a little bit more fun. They’ll move out as soon as they start seeing the migrations of spawning minnows and realize that it’s time to get hungry. On Tuesday, we did leave the area and we did find a second spot. It was located in shallow water between a river inlet and outlet. The ¼ mile long stretch of shoreline was home to a scattered, but catchable school of smaller male fish that were still showing obvious signs that weren’t ready to be done spawning. The problem for us was that those keeper fish were located on the windy side of the lake and the unpleasant conditions hampered our efforts to do a great job of gathering them. We did get some keepers though and we did prove the theory, again. So if you're on one of the “Slot Lakes” and find yourself in a similar situation, don’t be discouraged. Just don’t be afraid to start your engine and go for a ride, sooner or later you will find them and they are biting! ... and then I asked the guy, you seem upset, why? That's when he asked; "Who the heck is DALE WHEELER?" . (5/14) Gus' Place Resort, Ball Club Lake; "With only a day before the state opener we still had sheets slush blowing back and forth across the lake, but opener weekend was a beauty with plenty of sunshine and low winds. Surface water temps were in the mid to upper 40s, still on the nippy side. The morning bite was anything but great, but by mid-day anglers were finding cooperative Walleye, Perch and Northern in 6 to 10 feet near the Ball Club river. Slow presentation jig and minnow fishing, seemed to be working the best for most anglers. Last year’s opener was similar to this one and in looking over my notes from last year we had quite a good Crappie bite during Memorial weekend. This week will be on the cool side, but the weekend looks warmer. The best is yet to come, bring on the sunshine." - Gus Sheker, Gus' Place Resort . Fishing Report May 13, 2014 - Red Lake Action Not Hampered By Rainy Weather. If you were to spend the day fishing with my friend Craig Anderson, it wouldn't take too long to figure out that rain and chilly fingers just aren't enough to spoil a perfectly good fishing trip. For Craig, the quintessential "die hard" Walleye fisherman, even going fishless might not be enough to ruin his day. Luckily, I didn't have to find out about that on Monday. After a long winter, a few Walleye fillets for the table were high on the priority list. So when I mentioned to Craig that our trip to Red Lake on Sunday had been good, it didn't take much coaxing to schedule another run up there with him. The wind had switched to the Northeast overnight and the rain was already coming down, so fishing somewhere close to a boat landing was a priority too. Instead of fishing on the South side of the lake like we did on Sunday, we would have to start at Washkish this time. When we arrived, water levels and current flow in the Tamarack River were high. Not flood stage, but the water was moving swiftly. Surface water temperatures ranged from a high of 51 degrees in the river to LOW OF 49 degrees that we found about a mile down the shoreline. The water seemed warm compared to the 44-45 degree temperatures we found along the South shore on Sunday. At the mouth of the river, there was a crowd gathered already. As we passed through channel between the two parallel lines of anchored boats, we saw at least a dozen fish landed. Neither of us are the type who likes to fish in a big pack of boats, but even though we didn't plan to stay, I could tell that seeing all of those fish put a sparkle in Craig's eye. Now all I'd have to do would be to find a good spot of our own and then we'd have it made. Testing my own theory about the fishing pattern, I moved down the shoreline about a mile and stopped on a patch of gravel that I'd fished before. If I was right, there would be a school of post spawn, male fish waiting for us. There were, they were active and from then on, all I really had to do was keep the boat over the top of that gravel. The supply of fish in that area held up for most of the day. Almost every detail about the pattern was included in my report yesterday morning, so I won't go over it all again because all you have to do click here and jump to >> yesterday's fishing report for the details. The only notable differences today were the warmer surface water temperatures and the presence of some larger fish at the mouth of the river. In fact a quick stop at the end of the day gave Craig a chunky 24 inch fish in only a few minutes. The reason that there is a higher percentage of larger fish along the stretch near the river is because it's comparable to a major highway where the post-spawn females are migrating back into the lake after their spawning run up the Tamarack River. Later, when the Shiners begin to run into shallow water, the larger fish will become more evenly distributed as feeding becomes their priority. 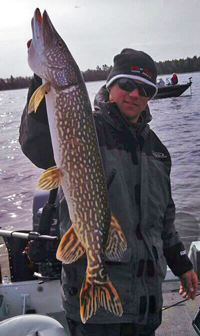 Fishing Report May 12, 2014 - Opening Weekend In Northern Minnesota Provides Welcome Relief For Winter Weary Anglers. Comparing the mood around Deer River to what it was like over last year’s fishing opener and is like comparing a kid going to the dentist with another kid who's going to the circus! I won't call it a stampede, but there were a lot more fishermen pouring into Northern Minnesota this weekend than there were last year. That traffic has been good for everybody in the Itasca Area and I for one, would like to say thank you to everybody who traveled into the area to wet a line. I hope that you had a great fishing trip! For me, it's been so nice to see folks smiling and enjoying the nice weather, it's helped make me more enthusiastic about the entire fishing season than I already was. (5-11) On Lake Winnibigoshish, fishing action was good too and as expected, there were a lot of larger female fish moving out through the gap and onto the big lake. Reed Ylitalo wrote; "We ended up fishing on Big Cutfoot Sioux today and fishing was good. We were catching lots of big fish between 19 to 24 inches which were released. The best technique today was back trolling at .3 to .6 MPH popping the jig off the bottom in depths ranging from 6 to 15 feet of water. Seemed like 1 out of 10 fish you could keep for a fish fry! Reed Ylitalo, Wings and Walleyes Guide Service . (5/12) From The Iron Range, Greg Clusiau - Crappies Stacked Up And Ready To Catch (If you know where to go) ; "Upper Red Lake fishing at it’s finest and just what I expected. Blake and I caught a couple dozen fish and left the lake early with our two person limit of eight fish under 17". Several 16" fish were tossed back along with a number of larger slot fish measuring up to 22". Upper Red wasn’t the only lake “on fire” last weekend, as Lake of the Woods/Rainy River and Big Winnibigoshish/CutFoot Sioux also kicked out monstrous numbers of nice walleye. If you missed it last weekend you owe it to yourself to get ... " >> Read Greg's Full Report . OH! And by the way, If you'reenjoying some of the aerial photos on these pages, then the next time you're heading toward Grand Rapids, please do me a favor and stay hungry until you can swing into the Dairy Queen at 1940 POKEGAMA AVE S GRAND RAPIDS, MN. It's "a sweet way to say thank you" to Eric for the pictures! (5/12) On Upper Red Lake this Sunday, "My Fishing Opener" was a great one. Joined by two of my favorite people, Bill Linder and Dale Wheeler, we trolled a few miles of Red Lake's shallow breakline catching Walleyes and solving world issues. The Walleyes were simpler than the issues. 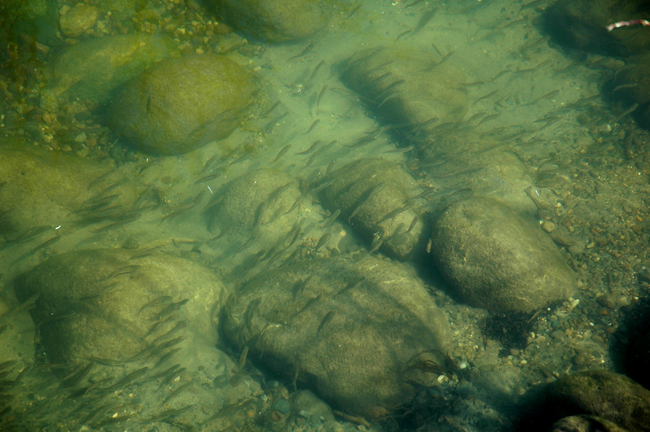 The surface water was cold, hovering between 44-46 degrees and as expected, shallow gravel areas were inhabited by schools of still spawning Male Walleyes. These male fish were still milting heavily and were aggressive. Female Walleyes have apparently already wrapped up their spawning cycle and left the males behind, hoping for a handful of ripe females to move shallow. 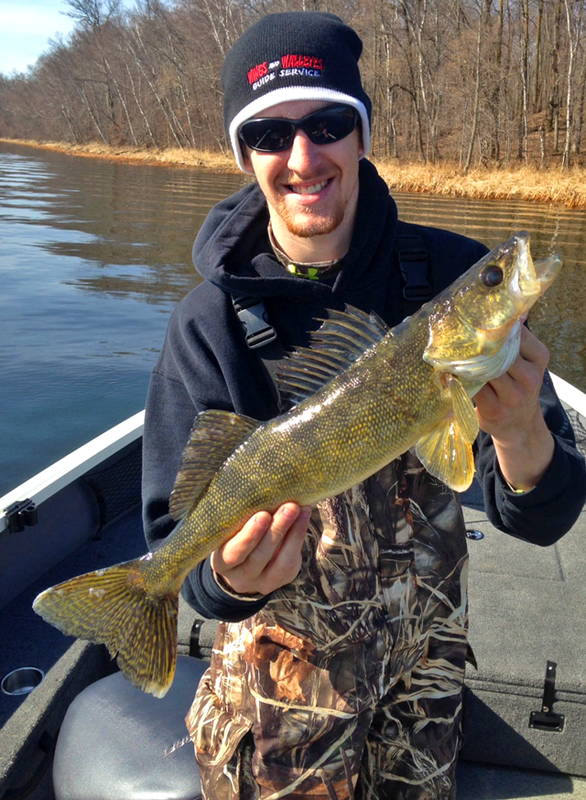 "Q) Why are the male (walleyes) so aggressive during the spawn and what triggers it! I have been told that they are protecting eggs, but that does not make a whole lot of sense since they do not build a nest. It is or was brought up on another forum so I decided to get the opinion of Ohio Sea Grant. A) You are correct; the male walleyes are not protecting eggs. Walleye are broadcast spawners which mean they lay their eggs or milt (sperm) in to the open water over substrate, usually gravel bottom. They don't build a nest, and they don't have any parental care. The males will hang around for a few weeks in the spawning habitat to continue to spawn, but the female fish usually just cruise up when it's time, lay all their eggs, and get back out to the lake. To answer the first question, the males are so aggressive mainly due to competition for females. Like many species (including humans!) mating season brings competition. A more aggressive male walleye can get better positioning close to egg laying females, and have more success fertilizing eggs. Since the males are on that habitat for so long, they could be a little hungry as well. As for what triggers it, it's just part of the spawning process. Photoperiod and water temperature both play a part, and with that comes changes in hormones at the chemical level. Similar things happen in other fishes with more visible consequences, like the "horns" (tubercles) on the head of a spawning male chub, or the gnarly curved snout (kype) on spawning male salmon." - For more information visit >> The Research Section of the Ohio Seagrant, OSU Website . Okay, Back To Red Lake; What this meant for us is that whenever I located a school of fish, all we had to do was catch one. The struggle put up by the hooked fish attracted others into the area and helped trigger a temporary frenzy of action. The secret to finding these active male fish is to seek out patches of small rock and gravel in shallow water. Key depths on Sunday were 3-5 feet and if we were getting snagged on the rocks, we were getting bit. Before we started fishing, we had spooled our reels with fresh line and we had each tied on a 1/8 ounce Lindy Jig. We tipped them with a variety of baits including Shiners, Rainbows and artificial tails. There were moments when the fish seemed to prefer particular baits over others. But invariably, their mood would change and some other preferred bait would provide a hot flurry of action. If you don't like getting snagged in the rocks and it prevents you from fishing these areas, then do what a lot of the locals do and switch to a slip float. A 1/8 ounce jig tipped with a minnow and suspended below a Wobble Bobber will cast a mile and produce fantastic results too. 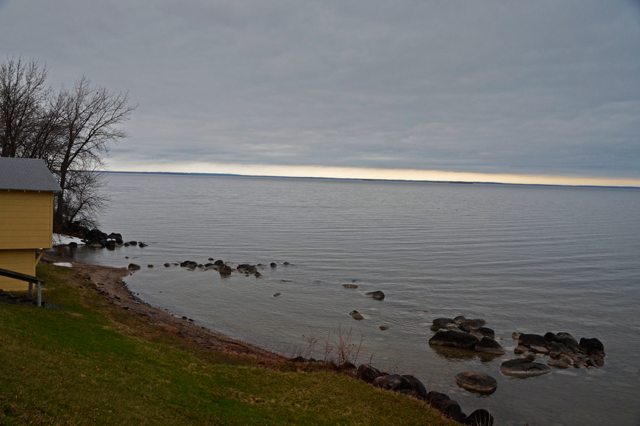 (5/12) On Lake Winnibigoshish, Joe Thompson, Four Seasons Resort says; "The Opener saw calm water and sunny skies! Haven't been able to say that in many years. The fishing was much better than I had hoped. With ice on the south end of the lake, I thought the water would stay very cold. That wasn't the case. By Saturday afternoon some surface temperatures were over 50 degrees. Most of the walleye action happened in and around The Gap where Cutfoot Sioux connects to the big lake. There were many reports of 40 fish caught. The only problem they had was they were all females and in the protected slot. Not a bad problem to have. It seems that the spawned out females were in the mood to eat before the males. It won't be long until the water warms enough to have the shiner minnows move toward the shorelines and have a normal spring bite. There will be plenty of fish to eat when that happens. The perch were very active this weekend. They were staging on the shoreline drops and getting ready to move in and spawn. All the females were full of eggs. So that was the best source of food for the ones who wanted to have a fish fry. I look for the fishing to improve daily as the ice disappears and the water warms. We have openings for the next two weekends, as well as a midweek special. If you are thinking about coming up fishing, don't hesitate to call. >> Joe Thompson, Four Seasons Resort . (5/12) From Lake of the Woods, Mike Kinsela, Border View Lodge; "What a beautiful opening weekend. Many boats on the water, everyone getting out and enjoying the sunshine! Fishing was good. There were a lot of slot fish caught and released this weekend while catching some keeper fish. Also a good number of fish over 28 inches caught. It was a fun and active opening day! The ice pack moved in yesterday pushing most boats into the Light House Gap or Four Mile Bay. However, today the wind has switched allowing boats to get onto the lake further. The rain has held out so far but we expect to get some rain this evening, as well as a good chance of rain through Wednesday of this week. Temperatures will stay in the mid to upper 40’s for most of the week with a good jump in temps for next weekend taking us into the 60’s. Make sure to bring your sunscreen as some of us forgot this weekend and ended up a little red." - 1-800-776-3474 Border View Lodge . (5-11) In Northern Minnesota, the fishing the opener was a hit for most of the folks who spent their time On Lake Winnibigoshish and Upper Red Lake. Two hotspots that kept popping up in conversation throughout the day on Saturday. Thanks to a break in the weather, anglers were able to get outside and enjoy the fishing opener under sunny, calm and warm conditions. A welcome departure from the cold, wet conditions that persisted throughout the past week. On Upper Red Lake, robust crowds and calm conditions were apparently welcome by the fish too! Reports of fast action and easy limits were already coming in before lunch time. (5-11) I missed the fishing opener myself yesterday, but I have a great excuse! One of the most beautiful, most talented and highly intelligent women who will ever walk this planet just happened to be born into my family. 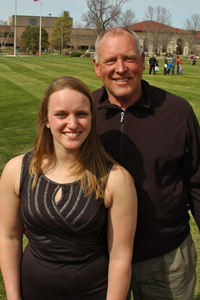 Yestereday, Annalee Michele Sundin garduated from the University Of Minnesota Crookston. Look out world, she's had big plans since she was about 4 years old and now that she's been unleashed, there's no telling what will happen! Oh, by the way, congratualtions honey, I Love You!! On Upper Red Lake (5/11) Eric Hutchins reported having his limit of Walleyes in about 10 minutes. Others weren't catching fish that fast, but they were catching them. In his own words; "A beautiful morning to be out. Arrived at Tamarack River about 5am. That was a great window to launch. There were about 12 rigs at the hatchery and 10 at the larger state access. By 6:30 we had boated 30 fish. 6 feet of water 1/8 fireball (yellows and greens) with fathead hooked through the head. Fish scatterd north and south on break once clear of channel markers. Gauntlet of boats at mouth which isn't the only place there are fish. Mostly all males but the females appeared to like larger bait. Shiners which my friends had produced larger fish. Many hits during short pause just after jig hit bottom on initial cast. A very good current at the moment on the river. Traffic at launches after 830 extreme. Flow of boats from Shooks cornor north as we headed south around 930 around 100 strong!" Everyone can agree that spring has taken it's time in arriving and that the long, cold winter will have an effect on our consideration of which lake to choose for "opening day". Normally when we have a late, cold spring we look at shallow prairie lakes that warm up quickly and are heavily stocked with walleyes and other game fish by the MN DNR. Fishing Report May 10, 2014 - Happy Fishing Opener! If you're reading this, I hope that it's because you're seeing it on your tablet or phone while you sit in the passenger seat of your fishing buddy's truck, on your way to the lake. If not, if you're at home, reading about fishing instead of doing it, well I feel your pain! Opening day has been pre-empted for me too, albeit for an excellent reason. I'll be attending my daughter's college graduation ceremony today, an event that I wouldn't miss for anything. Just think, she's been telling me that she's smarter than I Am for 22 years (almost) and now she can actually prove it! Traffic heading into the Itasca area on Friday was fairly heavy. In fact, Deer River even had a little traffic jam during the mid-afternoon. Bait and Tackle shops are doing their best to keep up with the demand, but due to the late ice-out, the supply of Shiners just isn't here yet. The limited supply of Spottails that I mentioned yesterday morning lasted until 9:00AM. After that, anglers switched to Rainbows, a supply that lasted until about 3:00 PM yesterday afternoon. From then on, the bait supplies will be fluctuating daily. Believe me when I tell you, nobody would be more happy to have the mother lode of Shiners in their tanks than would the Grand Rapids area bait dealers. This is a big weekend for them and they're more than a little disappointed that the spawning runs haven't started yet. There's something that we can all do to help the situation though. Be courteous! It's one thing to call on the phone and ask whether your bait dealer has shiners on hand. It's quite another to throw a "Little Kid Fit" if they they tell you that they don't. I know these folks and they are working 20 hour days right now trying to get you the minnows that you want. If crummy weather, government regulations and expensive gas hasn't stopped them, the least you can do is to try and be polite. Please? Thank You! (5/10) One nice Rainbow Chub + one 1/16 ounce Little Nipper = Fantastic Shallow Water Walleye Bait! Here's a personal fishing tip for you - Lindy's Little Nipper is most commonly thought of as a panfish treat. But for Walleye fishermen who need to use light tackle for getting into shallow places, the 1/16 ounce size is a perfect solution, especially when you don't have Shiners. When using Rainbows for bait, especially large ones; Lightly hook the minnow in the upper lip and forget about snap jigging or ripping the bait along the bottom. Instead, use the light jig to cast or drift through shallow areas while you're applying a more subtle, pulsating motion with your rod tip. When executed correctly, your rod tip should be in constant motion. It should look like you're pointing your index finger and giving someone a lecture. This subtle motion makes the minnow rock and roll from side to side and gives them the appearnce of feeding on the bottom. Rooting around in the sand and shallow weeds is the perfect place for this apporoach and if you'll give it a try, it just might become your new favorite. Fishing Report May 9, 2014 - Walleye Fishing Opener Is Upon Us! If you're one of the lucky ones who is headed up for the weekend, I hope your luck is fantastic! I won't be joining you on Saturday because my daughter will be graduating college, but beginning on Sunday, I'll be on the water for most of the next 5 months. Since You Know there's a spot for you and you're already on your way, we might as well talk about a few strategic ideas for the fishing opener. Comparing the conditions that we have today with those of a year ago, it's safe to say that we are roughly 1 week to 10 days ahead of the time table we were on last year. For me, that means that we probably won't get in on that "Pre-Spawn" feeding frenzy that wowed us during the first few days of the season in 2013. On lakes that are known for large migrations of spawning Walleyes, the spawning runs have already peaked, so we're more likely to find tougher, "post-spawn" conditions in many areas. My personal game plan for Sunday includes these 3 main elements. Small feeder creeks and rivers that are connected to good Walleye lakes produced well during the first week last year. I'm not counting on the same good timing, but it's worth a try and I do plan a quick check of the areas where we found spawning fish last spring. If they're not there, I'll move on. If the fish have alrerady migrated away from these tiny moving water spawing sites, my next step will be to check some of the deeper, main lake spawning territory. Areas with mixed gravel and small, fist size rocks in depths of 3 to 8 feet are good. Even if we discover that the larger female Walleyes have finished spawning and moved away, there are still likely to be some smaller, male fish lingering in these areas. The gravel/rock strategy will be especially good if it's overcast or breezy. The low light and current encourages fish to stick close to this type of structure. If there doesn't seem to be any connection to spawning sites at all, the next step will be to target feeding areas by finding the largest schools of baitfish. Locating the food sources will depend on the weather. Warm, calm conditions will encourage baitfish to move into shallow water. Cold, rainy days will send the bait back out onto deeper flats. Remember some of these 10 to 12 foot flat areas where you find lots of weeds later in the summer? Right now, these areas can hold lots of baitfish even if there aren't any tall weeds. There will still be enough cover lying close to the bottom to provide plenty of hiding spots for minnows. On lakes that have Northern Milfoil and Coontail, newly developing weed growth is easily fished early in the season, even in places that will become choked with weeds later this summer. Of course, watching your electronics is critical. Knowing that your sonar will lead you to both bait and fish, be persistent, don't spend time fishing in territory where nothing shows up on your screen. For me, spending a half hour or more without wetting a line while I move around watching the Humminbird is far from a waste of time. In fact, the time invested in searching for a productive spot will pay back huge divedends when I finally find what I'm looking for. Okay, so that's a really rough, thumbnail sketch of my game plan, but it does give you something to think about. About the bait supplies; Bait shops in the Grand Rapids and Deer River area have good supplies of both Rainbows and Fatheads. Spottail Shiners are going to be tough to come by, but if you're already in the neighborhood, Fred's Bait in Deer River does have a small supply. They don't expect them to last through the day. But if you hurry, you might be able to get a spot right behind me in the waiting line. At the Winnie Trading Post, they're anticipating a small supply of Spottail Shiners that is due to arrive later today. At the moment though, plan on finding Golden Shiners or Fatheads. They do not have Rainbows at the moment. Ben's Bait in Grand Rapids has an ample supply of Golden Shiners, Rainbows and what they tell me are the best looking Fatheads that they've seen in a long time. Spottails, no, but those big Fatheads could well be worth the stop. For me, it's only about the size and if the Fatheads are large, approaching the same size as a Spottail, then they are equal to or better than the shiners. River Rat Bait near Cohasset reported good supplies of "everything except Shiners". (5/9) On Lake of the Woods, Mike Kinsella at Borderview Lodge says; "We are excited to get back on the water and look forward to another great summer season. We have been busy with some remodeling in some cabins and getting things ready for opener. The winter has held out and spring seems like it is still yet to come. We are down to our last few piles of snow that still need to melt so the yard clean up has been slow going. The lake is open from the Light House Gap to Morris Point about ¾ of a mile off of Pine Island to about 30 feet of water. However, be aware of the ice pack we do not want to see anyone stuck in the ice. Bring your rain gear as we have a chance of rain everyday through next Tuesday. The temperatures will be in the mid to upper 50’s with Saturday being the warmest day at 65 degrees." - Have a fun! Be safe! 1-800-776-3474 Border View Lodge . Today is the last day that we're gonna be talking about ice around here. 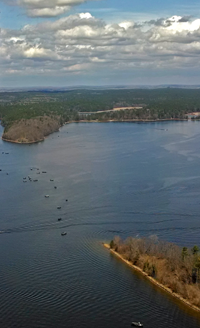 As of Wednesday, at least 75% of the Itasca Area waters are either already fully open or at least they are open enough for anglers to expect trouble free boating (5/8) A question about Leech Lake came in from our facebook page. Frank Weeda wrote; "Hey Jeff, Any word about the ice conditions on Leech Lake?" A) Frank, I drove over to Sugar Point Resort on Wednesday evening expecting to see some ice lingering around Portage Bay. I was pleasantly surprised when I saw nothing but open water! Looking South from Sugar Point, I noted that there was a little ice in the neighborhood of Pelican Island. But the water from Boy Bay heading West past Battle Point, West across the main bay to Ottertail Point and all then North all the way up to Federal Dam was ice free. There wasn't much point in driving around the rest of the lake because if there is any ice remaining, it will certainly be melted before Saturday. So there you go, Happy Fishing on Leech Lake this weekend! (5/8) On Lake Winnibigoshish, the scene at the Richards Townsite landing on the West side of the lake was more than encouraging. What appears to be ice from a distance is actually nothing more than a mass of floating ice cubes and now, it's surrounded on three sides by open water. The entire West side from the Missiissippi River inlet North to Stony Point is wide open. From Stony Point East to Tamarack Bay and then South to Bena is also wide open. Trapped in the middle is this tinkling mass of cocktail ice. But I think that by day's end, most of this will be melted too. For one last look at the ice conditions, click here for photos assembled by our staff of duly deputized, Fishrapper Cub Reporters. Click >> Ice Conditions Northern Minnesota (re-post) An email question from Jason Woodruff asks; "I'm wondering if you have any thoughts on selecting a lake(s) for opening weekend? Assuming that there is open water, is the best bet to still hit the big lakes like Leech, Winni, Cass, etc... and explore your shorelines and the warmest water you can find? Or should you target smaller (<750 acre), shallower lakes, and look for the warmest water you can find? Or something in between? Is a river inlet or outlet on the lake part of the equation? A) Jason this is a huge question and depending on an anglers knowledge of area water, it could have many answers. Here are few thoughts running through my head about my own plans for the opener. With some of the best spawning areas already open, the odds of us finding "pre-spawn" Walleyes like we did last spring have been greatly diminished. It's more likely that we're gonna hit the Walleye opener smack dab at the end of the spawning cycle. For me, that means planning my earliest fishing trips on lakes that have the largest populations of Walleyes. Instead of trying to get fancy, experimenting on some of the off beat water that I love, I will likely stick with one of the Walleye factories for the first few days. River fed systems like Winnie, Bowstring or the Cass Lake Chain are easier to fish because there are multiple locations to ambush male fish that are liable to be lingering in spawning territory even after the larger females have moved away. Water temperatue may be a factor, but don't put all of your eggs in that basket for opening weekend either. Temperature will become a lot more important later when it triggers spawning runs of Shiners, Perch and other baitfish. Looking for the warmest water on the fishing opener could actually backfire. You could easily wind up increasing your risk of locating post-spawn, negative minded fish. That said, if you located a pocket of warm water and it has attracted plenty of bait, by all means, you should try fishing there. Just keep in mind that finding "the warmest water" isn't a guarantee of success. An interesting scenario, if you can find it, would be to locate a lake with a well known population of spawning Walleyes, where he ice has just gone out within a day, maybe two of the opener. That's what happened here last spring and those were the early season honey holes. Most anglers trying to avoid the ice, sat out the first week of fishing. Meanwhile the fishermen who were willing to battle the ice chunks wound up having some of the best fishing they'll ever encounter. Without the benefit of a crystal ball, my gut feeling is that this will be a good year to open the season on Winnibigoshish. The Walleye population is high, there will still be plenty of fish in the shallows and there's plenty of space to move around. When push comes to shove, it's hard to find a lake that's much more reliable on opening weekend. Alternative ideas for me are Cass, Bowstring, Upper Red and Round Lake. I won't get realy excited about deeper, cooler lakes until Memorial Weekend this year. Of course, I'll be ready to make adjustments whenever the weather dictates. News Release: (re-post) DNR Closes Little Cut Foot Sioux Lake to Protect Walleye - The Minnesota Department of Natural Resources announces it will close the area extending from Williams Narrows upstream through the First River Flowage up to Egg Lake. "The closure will be in place beginning on May 10, 2014 through May 16, 2014. No fishing will be allowed during this time period in the specified area. Signs will be posted at the narrows and other access points within the closed area. Due to the late ice cover and early walleye opener, concentrations of walleye remain near the egg-collection operation at Little CutFoot ... read full story >> DNR Closes Little Cut Foot Sioux Lake to Protect Walleye .on Saturday. Fishing Report May 7, 2014 Jeff Sundin - The Countown To Walleye Fishing Opener 2014; All Systems Green For Go! It was a little tough getting started this morning, but not impossible. I Am on the job right now and even though the report is running a little behind schedule today, there's more coming, so it's going to be a good idea to check in again this afternoon. Just when I was starting to get worried, that my predictions of open water for the fishing opener could be at risk. 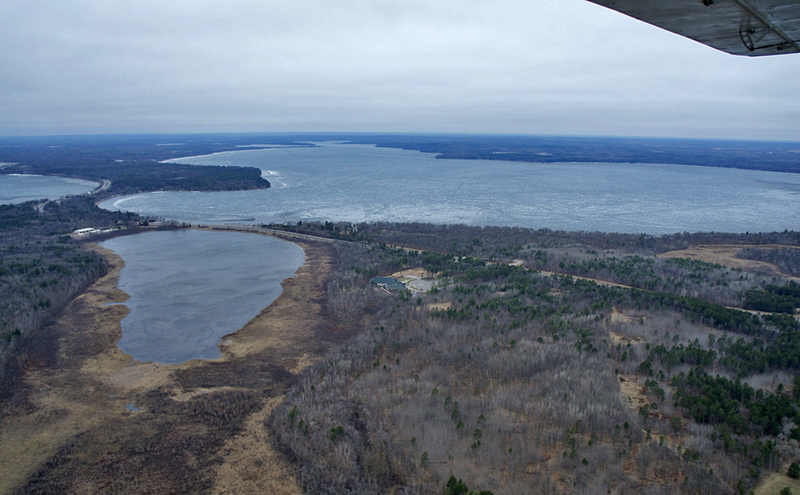 The ice on Northern Minnesota lakes began disappearing faster than we can keep track of it. Open water is quickly becoming the rule, not the exception. So if you happen to stumble into one of those gloom and doom people who believes that the lakes are still frozen, please remind them that if they don't want to get in their own car and go look for themselves, then the least they could do is to take a look at these images or the > Ice Conditions Northern Minnesota < already assembled by our staff of duly deputized, Fishrapper Cub Reporters. (5/7) Zippel Bay Resort, Lake of the Woods - Taking advantage of the open season on Northern Pike at Lake of the Woods is a great way to speed up these last few days of the countdown to the 2014 Walleye Fishing Opener. Fishing with dead bait below Thill's Big Fish Sliders resulted in a good catch for Jon Thelen and Nick Painovich on Tuesday. Northern Pike ranging in size from 25 to 38 inches provided the duo with an action packed morning on Zippel Bay. The Pike, recovering from their recent spawing run, are moving into the bay, showing up at somewhat random locations. Today's hotspot might not turn out to be good tomorrow. The trick to locating Pike in the shallow water bay is to find depressions or holes where a depth change of only a foot can make a big difference. The fish are typically on the move, but they will hold in these deeper pockets. Shoreline points can also provide fish with a stopping spot, giving anglers an ambush point. The most reliable way to fish for these post spawn Pike is with dead bait. For us, that was frozen Ciscoes. Frozen Smelt, when you can find them, are also high on the list of preferred Pike baits. Sucker Minnows or giant size Golden Shiners wouldn't be out of the question either. On Monday afternoon, I caught several fish casting a 5 inch Money Minnow. On Tuesday morning, casting didn't produce fish reliably. Conversely, the Monday afternoon dead bait bite didn't happen, but on Tuesday morning it did. At this point it's nothing more than a simple theory. But maybe a good game plan might be to float the dead baits in the morning and spend some time casting artificials in the afternoons. 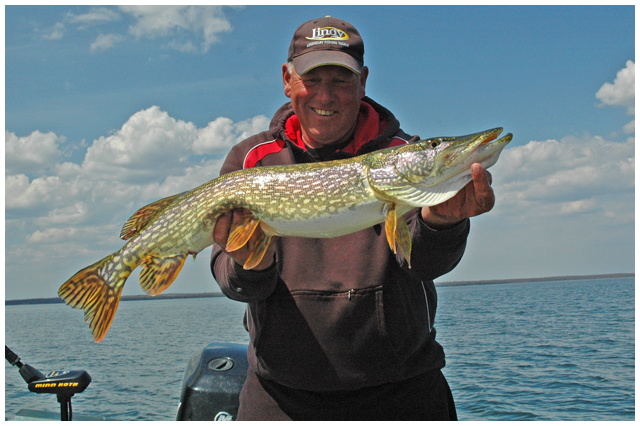 For more information about Zippel Bay's Pike fishing, call Nick Painovich 800-222-2537 Zippel Bay Resort . (5/7) On Upper Red Lake, the calm water and grey conditions made it tricky to see how far the open water extended from shore. What I do know is the that the Southeast wind had blown the ice sheet a long way out from where I had seen it on Monday afternoon. On the gigantic lake, wind direction will be crucial in determining fishable territory this weekend, but from what I could see, Upper Red Should be rocking and ready for fishermen this weekend! (5/7) An easy question from Josh Fjeld asks; "Jeff how is the ice on Winnibigoshish and Cutfoot looking for opener?" Images like this are what you'll see right now if you visit Lake Winnibigoshish. It is already open water for miles at the North end of the lake where Bill Heig snapped this photo at 7:00 AM today, Wednesday May 7, 2014. According to the Bowen Lodge Fishing Report, the docks at their marina will be in place today as they prepare for a full house of Walleye fishermen who will begin arriving soon. According to the DNR Fisheries Staff, Walleyes have already moved through Cutfoot Sioux and >> Read Full Report . On Monday, I jumped at the chance to make a quick trip to Lake of the Woods where I'd be able to try and capture one of it's giant Northern Pike. With lots of work to do before the opener, there isn't going to be a lot of time to fish, but even if I only have one day, you just never know, all it takes is one more cast! When I arrived on Monday, I had a little time to look around and do a little fishing. Traffic on the bay was really light. In fact, I only saw 5 boats all afternoon. I talked with several of the anglers and fishing reports were mixed, ranging from very slow, to fairly good. For me, 4 hours of fishing resulted in 5 fish boated, a half dozen sightings and one good fish lost before I could see it. Up here they say that casting for Pike is not the best way to get the real monsters, but sitting in the boat alone, watching my float isn't as exciting as casting, so I opted for action vs. size, hoping to get one phantom big fish. Of the 5 fish I caught, 4 were 28 inches and smaller. The 5th, a 37 incher isn't considered a trophy, but she did put up a good fight. More importantly, she gave me an optimistic attitude about the prospect of getting a bigger one today. This time I am going to take the advice of the locals and spend some time fishing with dead bait below a big Wobble Bobber. With a little luck, that will do the trick. 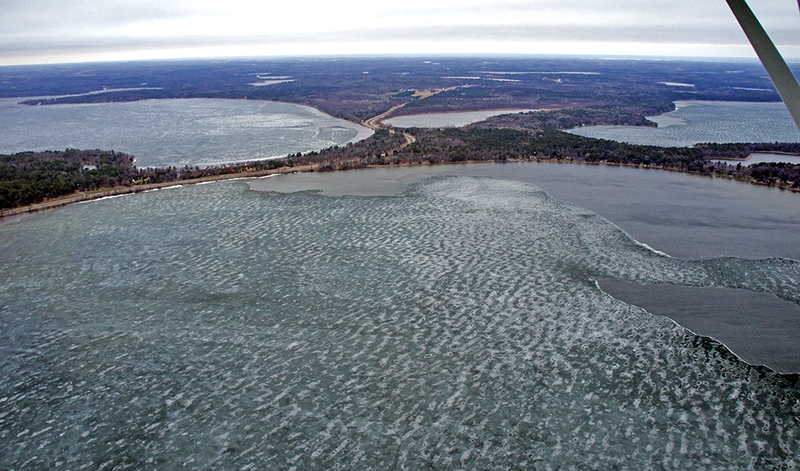 Ice conditions at Lake of the Woods could be tricky for the Walleye opener. 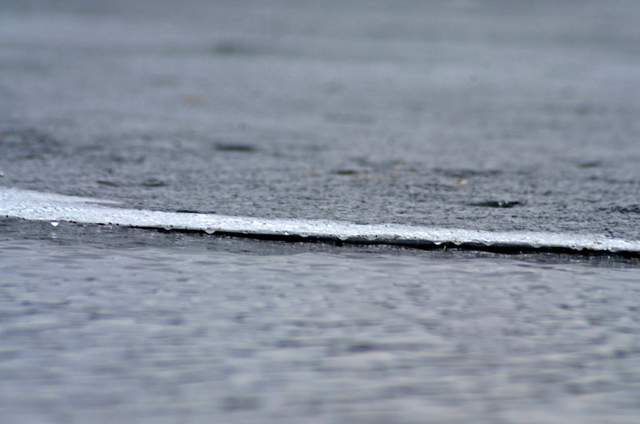 Recently, there was a band of open water almost a mile wide at the South shoreline. But that was before the winds shited and began blowing in from the North. I took the boat out to the edge of the ice on monday and discovered that now, the band of open water only allowed me to reach 8 feet of water. That could be enough to get into some action on Saturday, but that isn't an awful lot of room to work. We already know that the weather is going to force conditions to change before Saturday. So the real question is whether the wind will give anglers a break and blow from the South or if it's going to work the other way this year. - We will know for sure in just 4 days! Fishing Report May 5, 2014 Jeff Sundin - Mixed Reports About Ice and Water? On Sunday, our fishing trip wasn't really much more than a good excuse for a day of sunshine on the lake(s). Luckily, it delivered that and gave us a chance to get a better look at conditions on some of the lakes. When it's your first trip out onto water, before you've been anywhere or done anything, covering territory and watching the conditions is the most you can do. So that's what we did, watching the electronics and the shoreline, we eventually spent time fishing in Little Jay Gould, Big Jay Gould, the "Hot Pond" and some of the connecting channels in between. Based on past experience, it seemed like fishing in the "Hot Pond" would be a no-brainer, but not today. Except for an errant Largemouth Bass and a few small Pike, the lake wasn't giving us a lot to get excited about. The water level was fairly high and ranged in temperature between 57 and 59 degrees. It seemed warm enough to provide incentive for panfish to come and gather. But it must have either not been inviting enough or maybe if they were there, they were only there to rest, not feed. The good news is that these lakes were completely ice free, in fact we never saw as much as a floating ice cube on this excursion. There is still ice around that area though and we saw some of it. On both Loon Lake and Pokegama we viewed large patches still covered with dark, sloppy looking ice. Navigation would be possible, but a little tricky. Most of the ice on those two lakes will be gone in the next few days. Still hoping to find some Crappies, we loaded the boat at mid-afternoon and headed North toward the "Little Crappie Lake". The idea was that fishing the smaller lake would allow me to do a more complete search of the available water. Along the way, we traveled North on County Rd 62 where we could see from the road that Bass Lake's outer extremeties were open, but that there is still a large section of ice in the center of the lake. If somebody wanted to fish there, they could, but the ice would restrict you to certain areas of the lake. We got a few glimpses of Deer Lake too and for me, that was the biggest surprise. There were some broken spots in the middle and some wide gaps along the shoreline, but a lot of the ice still looked white and fairly solid. Stubbornly holding on to about 80% of it's ice cover, it looked doubtful that Deer's water will be ice free before the weekend. Moose Lake still has a lot of ice on it too, but on that lake, the remaining ice looks older, darker and more ready to crack up. When we arrived at our Little Crappie Lake, we found it calm and mostly ice free. In fact, the remaining cover may have looked like ice, but it was nothing more than a glorified sno-cone. Pulling the boat along side for look revealed that there was nothing left of the ice except the image of an old set of tire tracks and a lot of floating ice cubes, barely connected to each other. The surface temperature was 44 dgrees and the surface was mirror glass smooth. Perfect conditions to search for suspended fish. Locating Crappies wasn't all that hard. Moving the boat slowly and watching the Humminbird, we discovered that the fish were holding in deep water. There wasn't really any one key depth, instead it ranged anywhere between 20 and 28 feet of water. They were randomly grouped in schools ranging from only a half dozen fish, up to some fairly large looking schools. Almost all of them had one thing in common, they had lockjaw. In fact, if it weren't for catching some of the less stubborn, small fish I would have begun to doubt our ability to located them. As evening approached, it was becoming somewhat easier to coax a bite, but by 7:00 PM, the idea of staying a couple of more hours to test the theory of a twighlight bite didn't sound all that fun. So still having learned a lot, we called it a day, even if the even menu did call for hot dogs instead of Crappies. A word about the remaining ice cover; They say that seeing is believing. But I already Know that you can't believe everything you see. There are a lot of lakes that still have what apprears to be ice covering them. But on the majority of these lakes, it is not solid ice at all. The staurated, broken chunks are holding together, putting on a good show, but they are going to disappear fast, especially if we get a shifting wind over the next couple of days. If you were one of the folks who was persuaded to stay home over the opener last year, then you missed out on some really good fishing. I can't promise that the fishing is going be just as good this year as it was in 2013. But I do know that if you don't put your boat in the water, you ain't gonna catch nuthin'. (5/5) From The Iron Range, Greg Clusiau - Crappies Stacked Up And Ready To Catch (If you know where to go) ; "That was it. We’d have to travel south to fish with our buddies, even though it would turn out to be a 360 mile round trip. So with a plan in place, we left Keewatin at five o’clock Sunday morning and drove for over three hours to reach hot, proven, crappie action. A close knit circle of fishing friends allows one to do this and how nice it was not to trailer a boat that far. All we had to do was jump in one of their boats and get to fishing. Fishing guide Mike Raetz had been doing well on this little lake, catching and releasing hundreds of nice crappies. Mike was on hand with his boat, as was ... " >> Read Greg's Full Report . On Saturday, a tour of Pokegama Lake in Grand Rapids revealed numerous large patches of open water. Smaller bays are mainly ice free, main lake areas remain covered with dark, soft looking ice. I think that an adventurous fisherman could probably put a boat on the water and move around a little bit. But, during the next couple of days, access to good early spring fishing spots is almost certain. 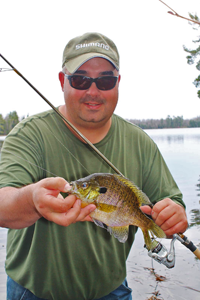 Boating aside, hoofing it to a shoreline fishing spot is definitely possible right now and whether it's located on Pokegama or another one of the smaller Grand Rapids area lakes, there is every reason to believe that panfish will be active today. Yes, I did say today! In fact I've had my eye set on this day for a while now because the weather forecast has been so promising. The NOAA says; "Sunny, calm and a high temperature above 50 degrees." Looking out of my window, I'm actually believing that it's gonna turn out to be accurate too. Right now it's crystal clear, the sun is rising and there isn't a breath of wind. So guess what? I've got the boat hooked up, the batteries charged and a tank full of gas. I've bot one of my best fishing buddies driving over to go for an adventure I'm not sure where we're headed, but we're hoping that there's a fish that's been planning an attack for today! Fish or no fish, we will be coming home with pictures from the lake, whichever lake that happens to be. (5/4) Wisconsin fishing season opened on Saturday And as near as I can tell, there wasn't much of a crowd. At least if there was, they didn't generate a lot of news. I know that it's not likely at the top of your list anyway, but I'm curious to know how it went and I'd love a note or two. Fishing Report May 3, 2014 Jeff Sundin - You Can't Judge A Book By It's Cover? No, that's right, but when the cover started getting a little outdated, I just had to take a day to get everything back up to code. So Don't Worry, the content is all the same and the commitment to quality is even stronger than before. The fishing season is only a little over a week away for us, but with open water cropping up everywhere, in only a few days, brand new fishing reports will flowing like crazy! (5/3) Pre-Season, Open Water Fishing Checklist Reed Ylitalo, Wings and Walleyes Guide Service . 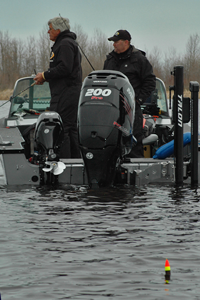 As May is here and the open water season is creeping up on us and will be here before we all know it. Here are a few things that I do to get ready and prepare my boat and gear for another great season on the water. First I go through my boat from top to bottom and front to back checking motor oil, lower unit oil, livewell pumps, bilge pump, I also make sure all my battery's are charged. I take a good look at my trailer tires and grease the wheel bearings if needed. After all this is done with the boat motor and trailer I move inside the boat and prepare all my fishing gear. I start by going through all my rods and reels, clean my reels and re spool new line. Next I go and do inventory on all my tackle and organize my boxes and make sure I have what I need day in and day out on the water. Last but not least a good cleaning of the inside and out and then I'm ready for the water! Reed Ylitalo - Wings and walleyes guide service . Fishing Report May 1, 2014 Jeff Sundin - Turning Over A New Page? This May just be the perfect time to get it done. Recently, I reminded myself of the auto mechanic who spends so much time working on everybody elses cars that he doesn't allow any time to get his own car fixed. After a long cold winter of working on all sorts of special projects, there are more than a few houskeeping issues stacking up right here on my own website. So since we Already Know that the ice is going to melt, I'm going to take advantage of this rainy day to breathe fresh life into a couple of pages that need some attention. BUT, BEFORE I DO, There's something that I need to mention. (5/1) When I was a teenager, if someone would have told me that there was a way to spend my summers working outside, on the dock, with boats, fish, sunshine and water, I'd probably have thought that I had gone to heaven. For the right young man, working as a dock hand at a popular resort could turn out to be a dream job! I know, it is work, (that's why they call it a job) but it's good work and when you do a good job at it, you make darn good money too! Well guess what? While I was talking with my friend Bill Heig, he told me that there's an opening for this summer at Bowen Lodge. They need a good reliable dock hand for this summer. I know a lot of the folks around that resort and I can say that it would be an awesome place to work a summer job. So if you know someone who is not afraid to pitch in and help get the chores done; Somebody with a good personality who makes friends easily and knows how to turn off his cell phone, then this could turn out to be a really great summer job. *** In fact, it's such a great summer job that it's already been filled! That didn't take long. The ice is all but gone now and by Tuesday mid aternoon it covered less than 50% of the lake. The las time we looked was at about 2:00 PM, so it could be completely ice free already. Even if the water wasn't completely open by the yesterday evening, it will certainly be gone sometime today. (4/30) "After a long, cold winter, Fish Ed. is proud to be back on the water and bringing you the hottest fishing tips from across the Midwest." This week on Fish Ed, Jon Thelen travels to Big Stone Lake which borders Minnesota and South Dakota. Pre-Spawn walleyes are this week's target and a Lindy Jig tipped with a minnow proves to be a deadly combination as the fish become more active as water temps rise throughout the day. 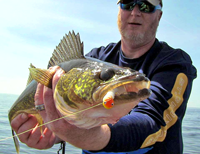 Get your first taste of open water Walleye fishing right here by clicking >> "Pitching Jigs for Spring Walleyes on Big Stone Lake" . (4/29) Rainy River Sturgeon Fishing was good for Ryan Botsford and crew. Camping on the river in their enclosed pontoon boat, the three fishermen boated about two dozen Sturgeon this weekend including a whopper. Botsford said that the 70 inch Sturgeon that he hooked at 2:30 AM took over an hour to land. He was lucky to get the fish because during the fight, Botsford's line broke. Luckily, he caught the line before it disappeared into the water and was able to hand line the fish into the boat. This wasn't the only big fish either. Botsford said that among the other fish landed by the crew were some fish in the high 50 inch to mid 60 inch range as well. The Krugs put on a good show for anglers on Lake Winnie the Sunday. Especially team leader Zachary Krug (above) who had the fish dialed in and eating out of his hand. Jacob Krug (below) wasn't far behind and has plenty to brag about himself. 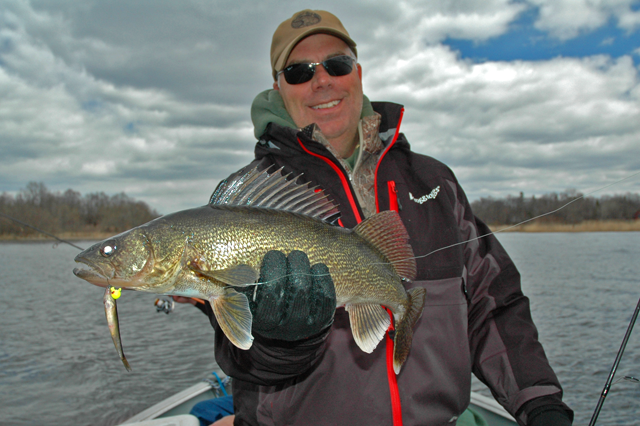 Jon Thelen travels to Red Lake for spring walleyes. Jon's approach for using Fuzzy Grubs tipped with shiner minnows for bagging some of these hungry northern Minnesota fish. Kenny Lashley (above) and Tim Fischach (Below) both had reasons to grin on Wednesday. For determined fishermen, Leech Lake Walleyes provided a day of steady fishing. Concentrate on shoreline breaks in 6 to 10 feet of water. For us, 1/8 ounce Lindy jigs tipped with Shiners were the best presentation. Rainbows produced too, but artificial tails performed poorly on this occasion. Photo courtesy Four Seasons Resort: "The walleye fishing has definitely improved in the keeper size category." But there are still some nice picture fish out there like this 25-3/4 inch caught by Scott Toppin from Waterloo, IA Read >> Four Seasons Fishing Report . Boat speed is super important and backtrolling is a great way to control it. But when there are 4 lines in the water, backtrolling can get a bit crowded. So I opted away from backtrolling and chose a controlled drift instead. Photo courtesy Reed Ylitalo: Upper Red Lake pumps out a lot of Walleye. But letys not forget about giant Pike. This one picked up Reeds jig and minnow while he was Walleye fishing on Saturday. Even on a tough bite, somebody always catches something. An 1/8 ounce Lindy Jig tipped with a 3 inch Shad tail took this Pike by surprise. Sunny, calm seas helped Red Lake surface temperatrues climb into the mid 50 degree range this Saturday. Baitfish and Walleyes were on the move and feeding agressively! Mark Huelse shows off one of his better efforts. Our presentation was simple. 1/8 ounce Lindy Jigs tipped with Rainbows, Fatheads and an occasional Shiner. Mark Huelse shows off one of his better efforts. For Dion Hook, the key location was a stretch of shoreline located near a popular river where Walleyes spawn. Working the breakline at 6 feet was the most productive. Photo courtesy Reed Ylitalo: Big Cutfoot Sioux has been absolutely phenomenal. Gail Heig, Bowen Lodge shows off another great CPR slot fish. But now there have been more keepers, under 17 inches and under fish showing up in the fish cleaning shack too. Cliff Hook shows of one of his better effrots. A healthy post spawn Walleye moving through the gap and into Lake Winnibigosh. Fishing the gap from Cutfoot Sioux into Lake Winnie provided plenty of opportunity for great photos of fish like this one caught by Mark Huelse on Wednesday. For eaters, a better strategy will be to ... Read the Lake Winnie Fishing Report . Dale Wheeler posing with one of his many girl friends! Post spawn female Walleyes are on their way back into open water. The larger females have left most of the boys behind and are moving along shoreline breaks located between spawing areas and main lake structure. Dale Wheeler posing with a great looking Crappie that he caught while he was waiting to catch a fish that he could get his picture taken with. Dale Wheeler posing with one of the many Northern Pike that were roaming the shallow breakline. 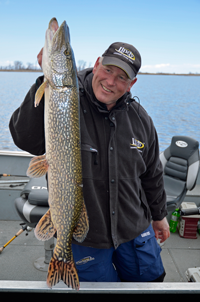 On Tuesday, Pike showed a preference for shallow, soft bottom areas vs sandy breaklines. After spending the day fishing for smaller, post spawn male fish, a quick stop at the mouth of the Tamarack River near the end of our day gave Craig a chunky 24 inch fish after only a few minutes. Photo courtesy Tom Howell who along with his twin boys, Tommy & Tegan, spent a great day on Cutfoot Sioux. The trio pulled in a bunch of "slot fish" and 10 keepers too. The secret to finding these active male fish is to seek out patches of small rock and gravel in shallow water. Key depths on Red Lake this Sunday were 3-5 feet and if we were getting snagged on the rocks, we were getting bit. Photo courtesy Eric Hutchins: Fishermen lined up along the bar between Seely and Battle Points on Cutfoot Sioux. 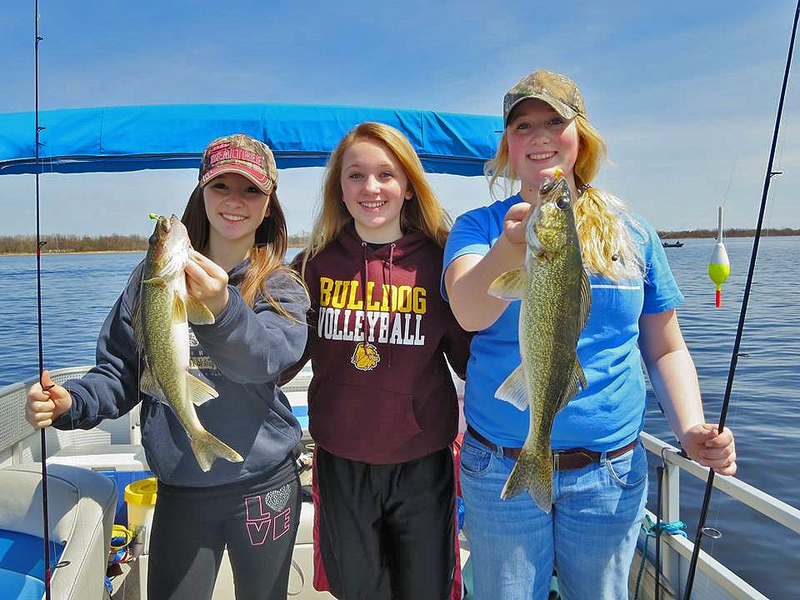 Opening weekend anglers enjoyed releasing Female Walleyes that were migrating toward the main lake. Photo courtesy Jon Thelen: Who borrowed Saturday to fish with his son Nate Thelen, pictured here with his first Mille Lacs Lake Walleye of the 2014 season! Photo courtesy Chad Peterson: Professional tournament angler John Mickish poses with a beautiful walleye before releasing it back into the busy waters of Upper Red lake. 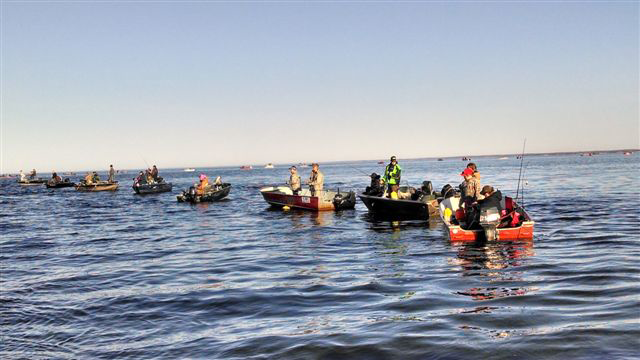 Read Ful Report >> Red Lake Walleye Weekend . Photo courtesy Eric Hutchins: Calm seas and sunny skies encouraged robust crowds for the fishing opener on Upper Red Lake. 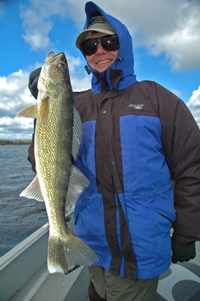 Walleyes welcomed the warm condtions too and helped reward anglers by giving them their full cooperation. Photo courtesy Greg Clusiau: Upper Red Lake action was good for Alicia, Brandi, and Sav Stougard caught posing with some nice walleye caught on Saturday while fishing with their family. 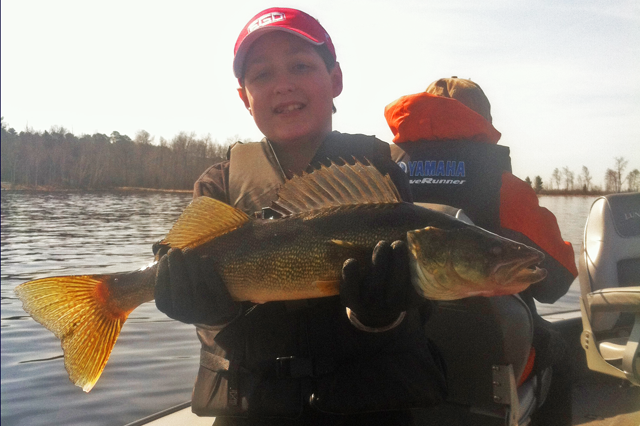 What does Lindy's Little Nipper have to do with spring Walleye Fishing? Click here to see the report and find out >> Tricks For Shallow Water Walleye . Bait dealers are doing their best, but they are frustrated that spawning runs of shiner minnows hasn't started yet. Sunshine and calm water will help encourage minnows to move shallower. There's more than one way to count the days before the Walleye fishing opener. Nate Thelen and Reed Olson have been sneaking around the metro region lakes catching Crappies. An ultra light rod, a handful of Little Nippers and few slip floats are all you need to get in on the action. Looking South from Sugar Point, I noted that there was a little ice in the neighborhood of Pelican Island. The water from Boy Bay heading West past Battle Point, then West across the main bay to Ottertail Point and then North all the way up to Federal Dam was ice free. From Stony Point East to Tamarack Bay and then South to Bena is also wide open. Trapped in the middle is this tinkling mass of cocktail ice. But I think that by day's end, most of this will be melted too. 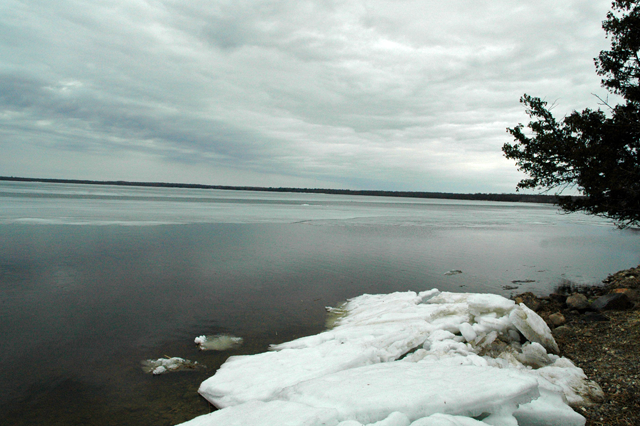 On Lake of the Woods, the main lake remains mostly ice covered. Small bays are open though and Pike like this one have already been into the shallows and finished spawning. Lake of the Woods still has a lot of ice cover. This was the scene on Monday afternoon. According to folks at the resort, there was almost a mile of open water before the North wind came and pushed it back toward shore. Photo Courtesy Greg Clusiau; Who used thew term "stacked" to describe what he found when traveled to central Minnesota to team up with Mike Raetz (above) last weekend to get in on fast biting ice out crappie action. To the casual observer, this looks like ice, complete with the old set of tire tracks. But when we pulled the boat along side it, all we found was a sea of floating ice cubes. After a long, cold winter, Fish Ed. is proud to be back on the water. This week on Fish Ed, Jon Thelen travels to Big Stone Lake where pre spawn Walleyes were beginning prowl. On Saturday, a tour of Pokegama Lake in Grand Rapids revealed numerous large patches of open water. 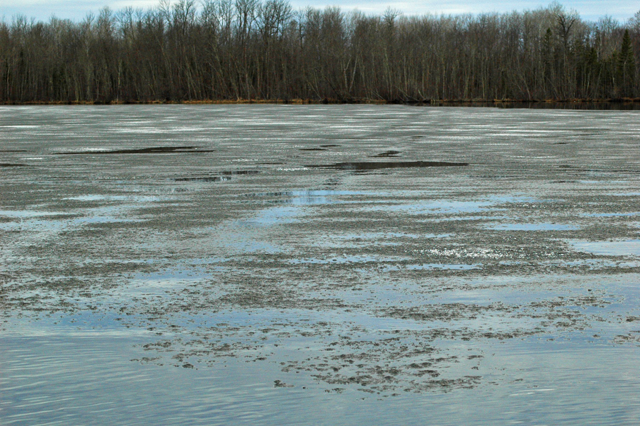 Smaller bays are mainly ice free, main lake areas remain covered with dark, soft looking ice. See more >> Images of Pokegama Lake Grand Rapids . 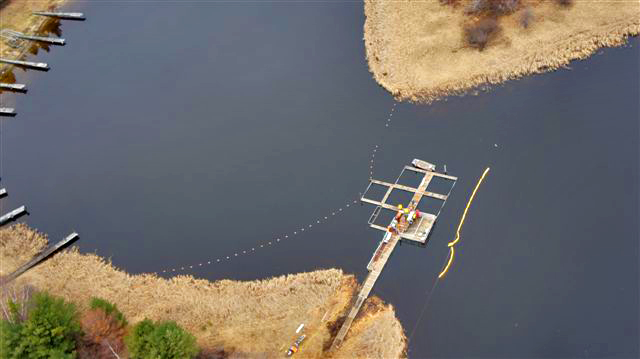 Aerial Photos provided Courtesy Eric Hutchins: Aerial View of the Walleye Egg harvest station at Little Cutfoot Sioux. The ice is out on Little Cutfoot and the trap nets are set. 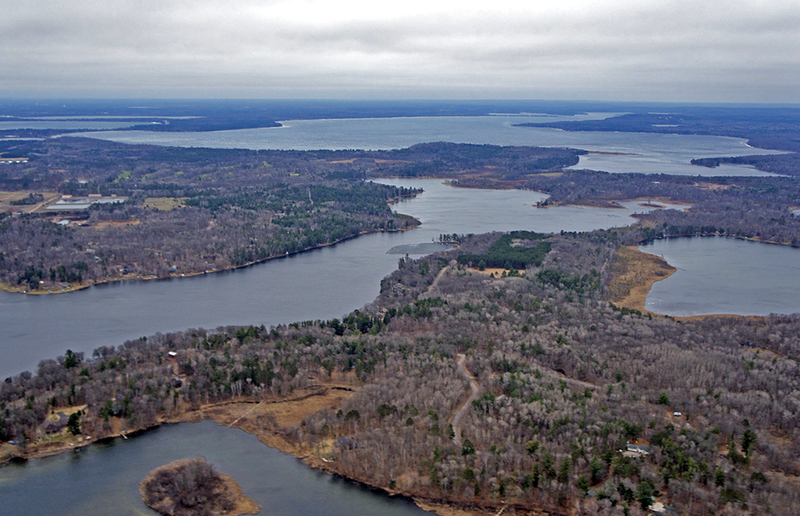 Third River Flowage has broken up as of May 2, 2014. The MN DNR fisheries staff has begun moving equipment onto the Walleye Egg Harvest site at Little Cutfoot and word is that they will begin setting their trap nets on Thursday. With a little luck, they will begin finding fish in their nets on Friday morning. A glance at Williams Narrows Web Cam reveals open water through the narrows and out into Cutfoot Sioux. Photo Courtesy Ryan Botsford: Who managed to CPR this 70 inch Rainy River Sturgeon in spite of breaking his fishing line during the fight. Photo courtesy Greg Clusiau: Open water already covers more than half of the state and Walleye pro Ray Welle enjoyed some of it on his trip for early ice out crappie action. >> Read Greg's Report . 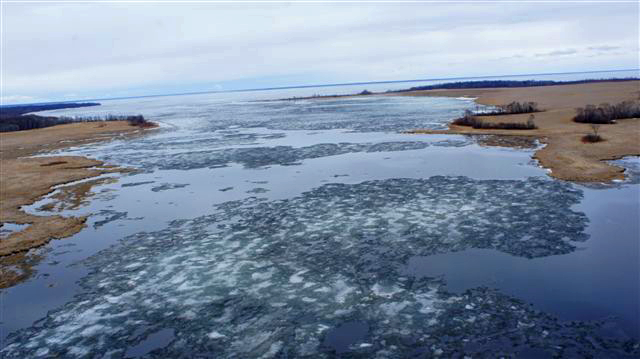 Photo Courtesy Bowen Lodge: Lake Winnibigoshish is losing ice cover. This stretch of shoreline along Bowens Flats is host to a 200 foot wide band of open weter and when the winds shift back to the West, it's going to break up fast. Read >> Bowen Lodge Lake Winnie Fishing Report . At Bowstring Lake's North access. open water spans 100 feet or more from the shoreline as of 4-27-14. On Bass Lake's North Bay, the ice is almost Black, but it's still covering 95% of the surface. Sorry Roger, but I can say that it's not going to be open today.